In a study by Cunningham and Stanovich (1997), the vocabulary skills of first-grade students predicted their reading achievement in their junior year of high school. A study by Hart & Risley in 1995 found that by the age of 3, many low SES children already displayed a large gap in vocabulary compared to peers of higher SES. Three years later, we learned that this gap in vocabulary was directly related to reading and comprehension success (Snow, 1998). Many classroom teachers are in need of more effective vocabulary instruction (Broomley 2007). Are You Making This Vocabulary Mistake? Our students’ vocabulary skills are directly related to their comprehension abilities. 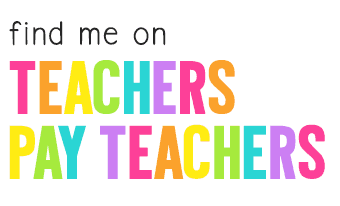 <– As primary teachers, that’s not a statement we can take lightly. Yet many teachers do not have a dedicated “vocabulary” time built into their day. In my own classroom, my vocabulary instruction often consisted of reading picture books and pointing out interesting words while I read. I would quickly share the meaning of the words and move on. I did the same during my small groups, with the exception of an occasional vocabulary activity. Besides directly teaching science and social studies words from our units, I really didn’t know WHAT words to teach or how to teach them effectively. The “bulk” of my vocabulary instruction happened during my read aloud. I felt like I was being proactive in the area of vocabulary when I shared a new word and its’ meaning. But after I shared a new word? I often just moved on and kept reading. My students would occasionally chime in with a thought or two about the word, but that was it. I rarely-if ever-revisited the word with my students. The new words we learned in our reading of Owl Moon usually didn’t make their way back to my students again. My students were passive word learners-not active word learners. They listened to the words and meanings, but they didn’t use, play, explain, connect, or own the words. I found out quickly that my read aloud time was not enough. My students deserved strategic vocabulary lessons and engaging opportunities to interact with robust Tier 2 vocabulary words that they could connect to their everyday lives. So many of our students already have a vocabulary gap when they come to us as kindergarteners, first-graders, and second-graders. The last thing we want to do is widen that gap by putting off vocabulary instruction or not giving it the attention it deserves. However, sadly, many teachers don’t know how to teach vocabulary effectively. Their direct vocabulary instruction is limited to the words they point out in their daily read aloud. Today, let’s chat about how to fix that! Vocabulary and A Weight Loss Goal? Let’s compare vocabulary to a weight loss goal. Pretend your goal is to lose 10 pounds. You know exercise is important. You know that research has shown physical activity benefits your health and lifestyle. You know that there are resources out there to help you exercise. However, without a plan in place, you have no way to strategically integrate exercise consistently into your daily routine. So, you try to squeeze it in here and there. What happens? You make some growth, but you don’t meet your goal. Why? It was “hit or miss.” To put it simply? You didn’t have a plan in place. Vocabulary instruction needs to be given the same attention as your sight word, phonics, and math lessons. 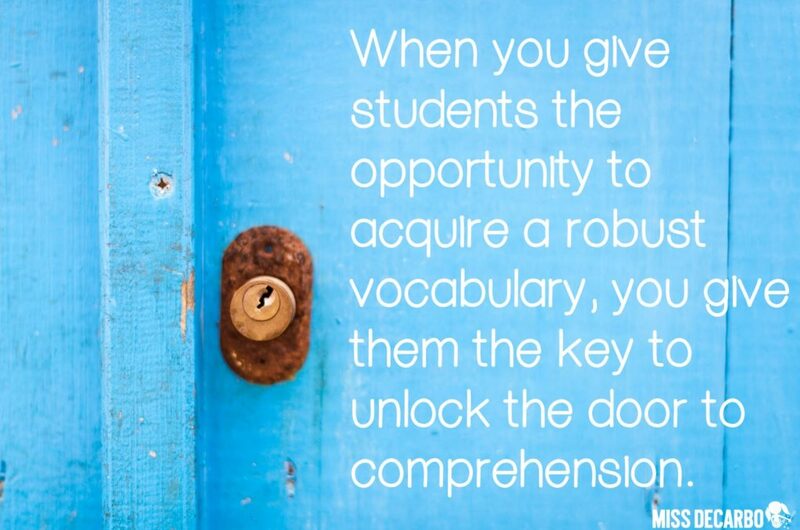 When you give your students the opportunity to acquire a robust vocabulary, you give them a key that unlocks the door to comprehension, writing, and rich conversational skills. Three years ago, I stood in a casino in Las Vegas with Jen Bengel, from Out of this World Literacy. We were there for a teaching conference, and we were chatting and killing time between sessions. Our conversation turned to what we STRUGGLED to teach. Vocabulary. Neither of us had the practical tools we needed to explicitly teach vocabulary. Although we had picture books with robust vocabulary, pointing out words and quickly talking about them wasn’t making anything stick. My first graders needed something more. Her sixth graders needed something more. We both knew that we needed to do something to help teachers have a ready-to-use and easy-to-follow vocabulary routine. Over the past three years, Jen and I have done just that. After years of collaboration, we launched our Vocabulary Curriculum resources for kindergarten through sixth grade, and we couldn’t be more excited! Now, we have a plan in place. A consistent routine, materials, and everything laid out for us has made all the difference! 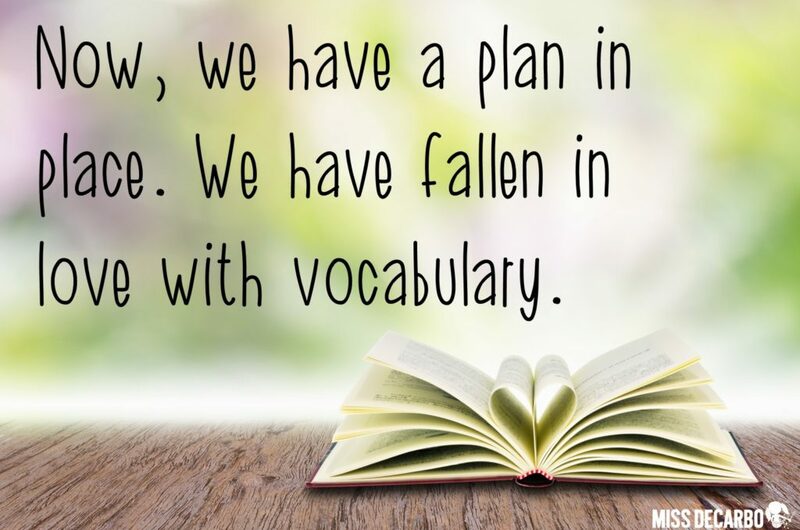 We have fallen in love with vocabulary. Our students have fallen in love with vocabulary. Now, we get to share this love with YOU! not sure what type of activities or lessons to teach throughout the week? needing reassurance that what you already are doing is on the right track? feeling frustrated (like Jen and I were) with a lack of vocabulary materials and resources to use in your classroom? lacking a consistent and strategic vocabulary plan for you and your students? I tried HARD not to show the pain on my face. But inside, my teacher-heart was crying. You see, if we wait until we think our students can read independently before we really give them explicit and strategic vocabulary instruction, we are doing those sweet babies a HUGE disservice in so many areas of their lives. If we wait too long to focus on vocabulary, our students enter the reading world and join other students who have already fallen so far behind in the vocabulary gap. Then, their third, fourth, fifth-grade teachers (and beyond) start to play a really exhausting game called “catch-up” when it comes to vocabulary development and the effects it has on reading comprehension. Kindergarten teachers, hear me out loud and clear because I’m about to use my teacher-voice: Your kindergarteners are FULLY CAPABLE of learning tons and tons of Tier 2 vocabulary, understanding it, using it in conversation and in life, and applying it. Will they be able to read the words independently? Probably not, but that’s not our goal for this program, or right now. Our goal is to expose our kindergartners to as much vocabulary as we can (while providing rich application and instruction) so that our students are NOT the ones that fall into that gap as they get older. They are the ones that THRIVE because we were intentional in knowing this is a skill that every child needs and deserves. If they are intentionally learning how to use new vocabulary within their conversations, discussions, and real life situations, they will also increase their reading comprehension skills. And later, they will be able to use these words within their writing. Simply put? Putting time and focus on vocabulary instruction is ALWAYS worth it. How Can I Teach Vocabulary In Kindergarten? In kindergarten, we’re going to teach vocabulary DAILY and we’re going to make it rich in oral language participation, teacher read-alouds, fun word play activities, playful interactions with the words, and TONS of opportunities to learn how Tier 2 words work within their everyday lives. We want them to be exposed to robust words that they will utilize for years to come. Let’s take a look at the kindergarten weekly vocabulary routine! 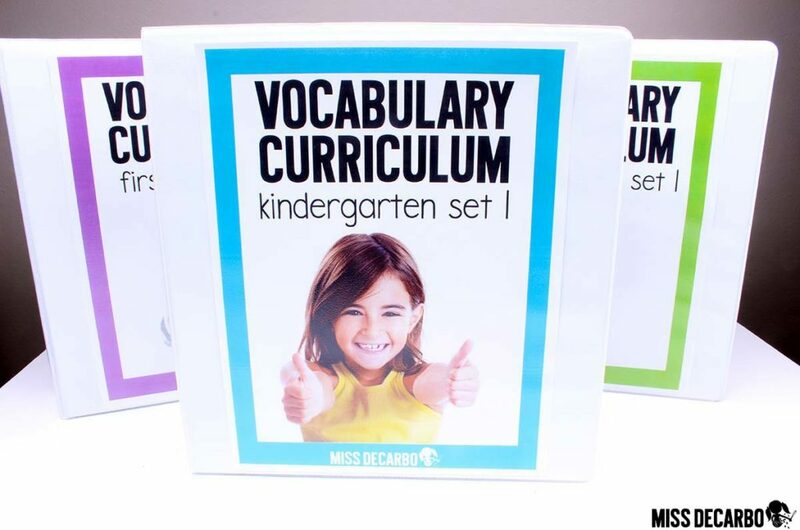 The Kindergarten Vocabulary Curriculum is divided into quarterly sets. Each set covers eight weeks of instruction. Why eight and not the standard nine weeks? We want this curriculum to be flexible and REAL for teachers. Let’s face it. You’re not going to launch yourself into a vocabulary routine the first week of school when you are focusing on routines and procedures. You’re also going to need some extra time during the last week of school. You may want to spend some time enjoying holiday activities in December. Eight weeks provides you with the flexibility to be a real teacher who has real interruptions that happen in the school-week! Pretty fantastic, right?! A Weekly Routine for Kinders! 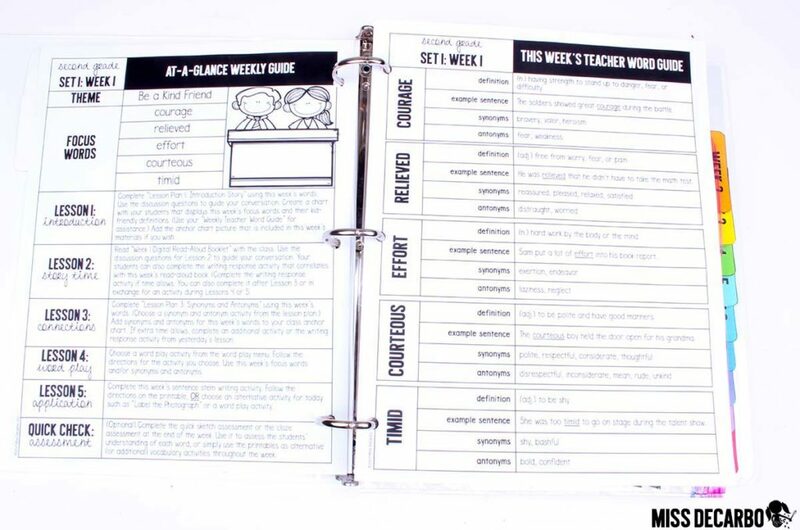 Each week comes with an At-A-Glance Weekly Guide and a Teacher Word Guide. The Weekly Guide will give you a quick snapshot of your routine for the week. You’ll see a weekly theme, three focus words, and a snapshot of each day’s lesson. On the Teacher Word Guide, each focus word for the week includes a kid-friendly definition that you can use, an example sentence for your anchor chart (if you want to create one), and a list of synonyms and antonyms that you are encouraged to expose your students to and discuss throughout the week. If the word contains a multiple meaning, that information is provided, too. You may be wondering, “Where did the word lists come from?” Since we know from research that teaching words in isolation is not effective, these words came directly from the passages and stories I wrote for the curriculum. These passages and books were strategically written to include appropriate and meaningful Tier 2 words that your students will see, hear, and read within real-life situations, conversation, and in texts. Even if you see a word on the list that you think your students have heard before, I encourage you to honestly ask yourself: “Are they using the word in conversation, on their own?” The chances are, your students have heard the word proud before, but if they are like my students, most kindergarten students are saying, “I feel happy about my drawing,” or “I like my drawing.” Are you hearing them say – on their own – “I am proud of myself for making this drawing!”? This vocabulary routine can change all of that! 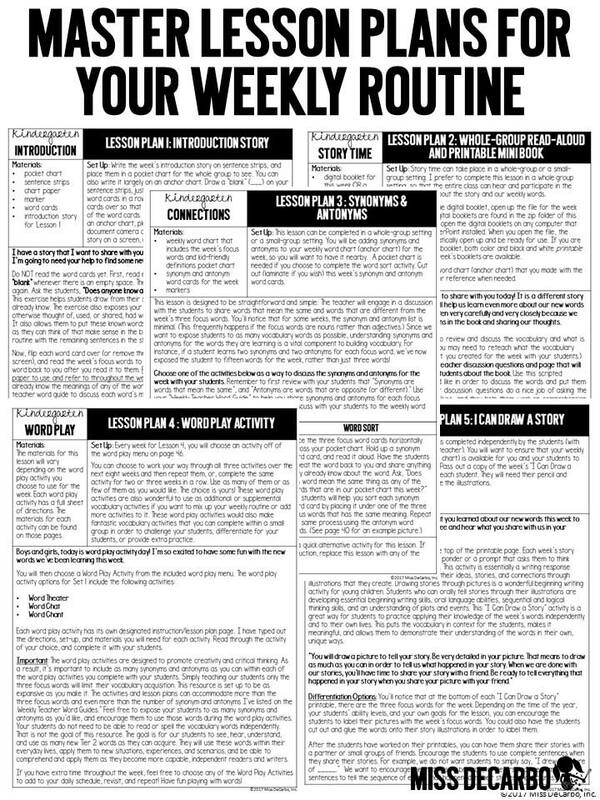 I have developed five “Master Lesson Plans” for the weekly routine. This is the magical part of the kindergarten vocabulary curriculum. You can rest assured that your weekly routine is consistent enough for students to feel confident in what they will do and what to expect each day. Each day’s lesson for the week follows one of the master lesson plans – the only thing that changes is the focus words each week! Within the master lesson plans, I have also provided optional “alternatives” and ideas to swap out if you are someone who wants and chooses to “mix it up” each week or every few weeks. The lessons provide detailed instruction, but the weekly routine has been set up to allow flexibility for you. You can truly make this “your own” if you wish, or, you can stick with my weekly suggestions. Day One: Introduction and Chit Chat! On Day 1, we’ll do a quick “Word Prediction” activity before we introduce the week’s words. 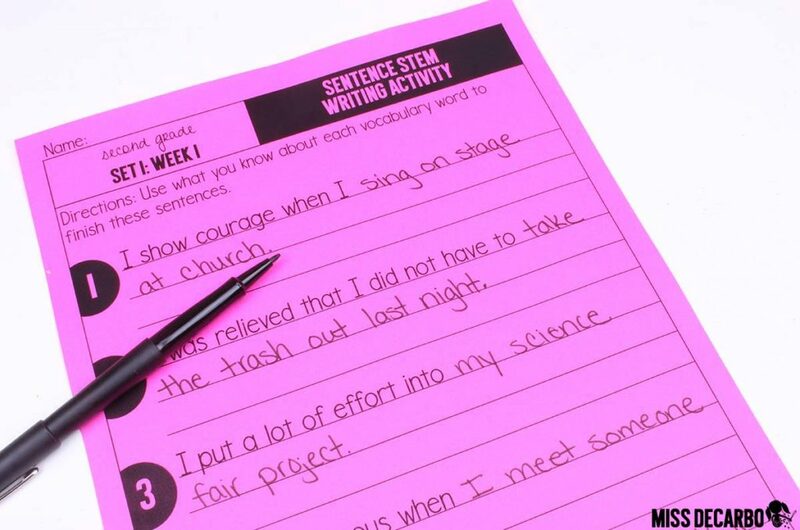 You can choose to write the week’s introduction story on sentence strips (It’s only about 4-5 sentences. It’s SHORT!) and use a pocket chart to make the activity interactive, or, you can use the provided introduction printable and simply project it onto your screen. (There’s no need to write out the passage if you do not want to. I prefer to use a pocket chart because I like the kids to be able to physically move the words around and interact with the story, but you can simply project the passage printable if you’d like and cover the words up with a sticky note.) Before I show my students the words, I read the entire short passage to them. I say “blank” when I get to a blank. Then, I read the first sentence and ask the students, “What word COULD make sense in this sentence?” For the passage below, they may say things like “Today is a beautiful day!” or “Today is a nice day!” This is showing me if they are understanding the general context of the story or not, even if the words they are predicting aren’t the words of the week. It helps students to start to think about what is happening within the passage. This only takes 2-3 minutes to do. Simply read the passage again and call on various students to share their word predictions. Now, we will flip the three focus words over and introduce them to the students. Say the first word and have your students repeat the word back to you. After asking the students to share what they think the word means, share the kid-friendly definition with them. Repeat this process for each of the three focus words. This will take just a few minutes of your time. After you have introduced the words to the students, it’s time to put them into context! Read the passage again with the students, and stop after each sentence or “blank.” Ask the children to help you decide where each word fits within the passage. This is your typical “cloze activity.” Cloze concepts are really important to vocabulary instruction at the primary level. It helps students to understand how to use sentence-level context to decipher and understand the meaning of words and phrases. This is the beauty of this vocabulary curriculum – we are never teaching words in isolation. We are ALWAYS teaching words within context and real-life application. The discussion will take about 5-8 minutes, bringing your total estimated time (this varies according to the time of the year) to only about 15 minutes for Day One! A full page of Optional Teacher Discussion Questions for the introduction passage is provided for your class discussion. This is completely optional, but I highly encourage it because it is truly the MEAT of the program. During your discussions about the passage, you and your students will have rich conversations about the words, apply them and use them in real-life situations, and play valuable word games that encourage the students to not just hear the meaning of the words but use them and learn how they connect to their real world. Day 2: Story Time and Mini-Book! On Day 2, you and your students will enjoy a read aloud that uses the focus words again, but this time, in a completely different context. You see, want our students to not just hear, read, and talk about words in context, we want them to be able to apply those words in many different situations and experiences. Day 2 will provide instruction in the week’s words again, providing that repeated exposure, while helping them to make connections to new scenarios and life experiences. The best part?! Day 2’s read aloud comes in a DIGITAL BOOK and a printable book – so you can choose! I LOVE projecting the digital book for my entire class to see as I read it aloud to them. It makes it easy to have rich class discussions when everyone can see the words and the pictures. The best part? You could certainly think of these games, lists, and examples on your own all year, but I’ve laid it all out and have ALL OF THE HARD WORK done for you! 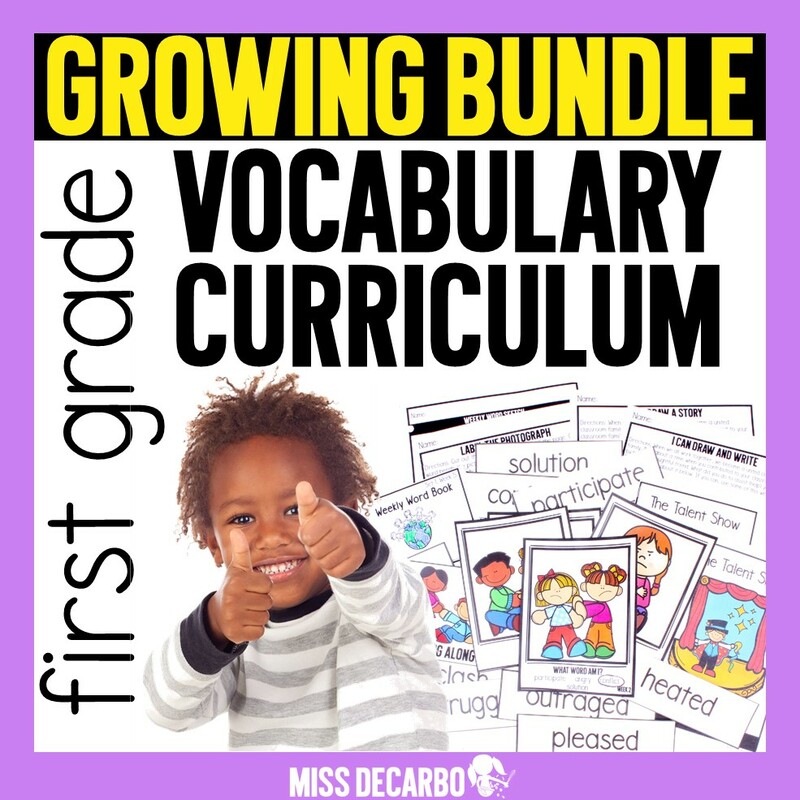 The only thing you have to do is enjoy your rich vocabulary discussions with your kiddos! 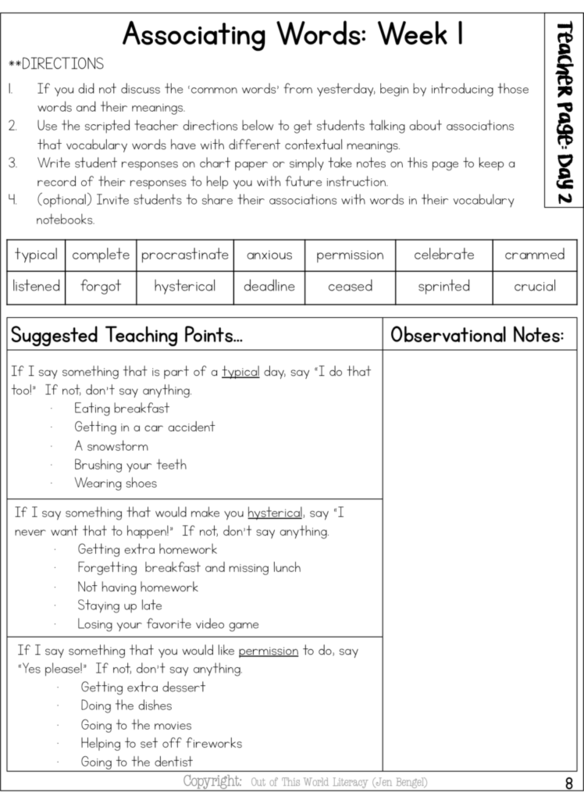 Below, you will see that every digital book for Day 2’s lesson comes in a printable version as well. A color and a black and white “printer-friendly” version are included. 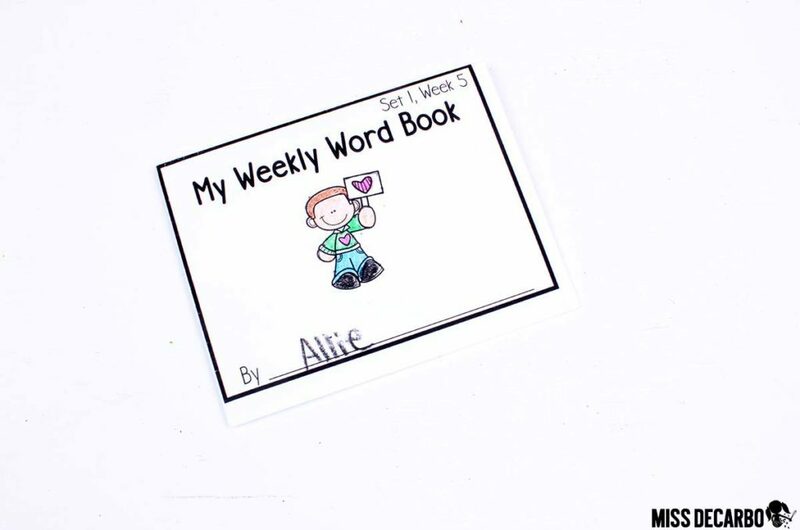 After you read the book aloud and have your vocabulary discussion, your students get to apply the words to their own lives with their My Weekly Word Book! It is really easy and doesn’t take much time at all! Let’s take a look at an example that is in Week 5 of the Kindergarten Vocabulary Curriculum for Set 1. 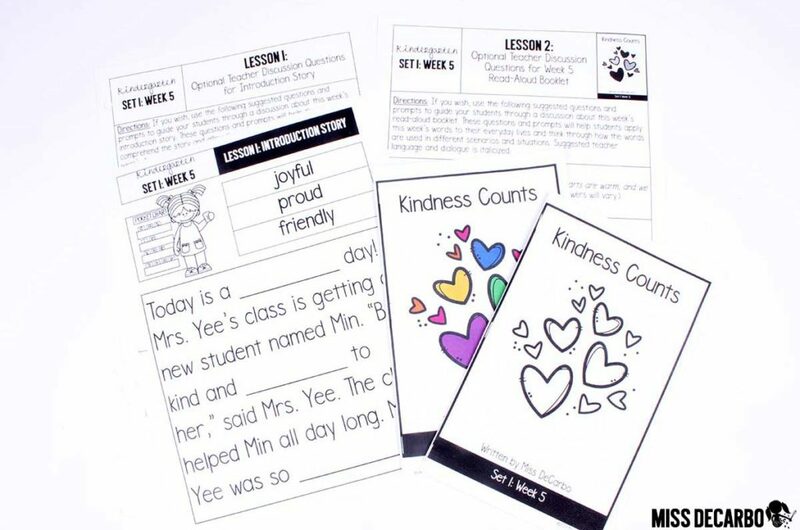 This is simple, one page foldable is a mini-book that your students can take home every week and share with their families. 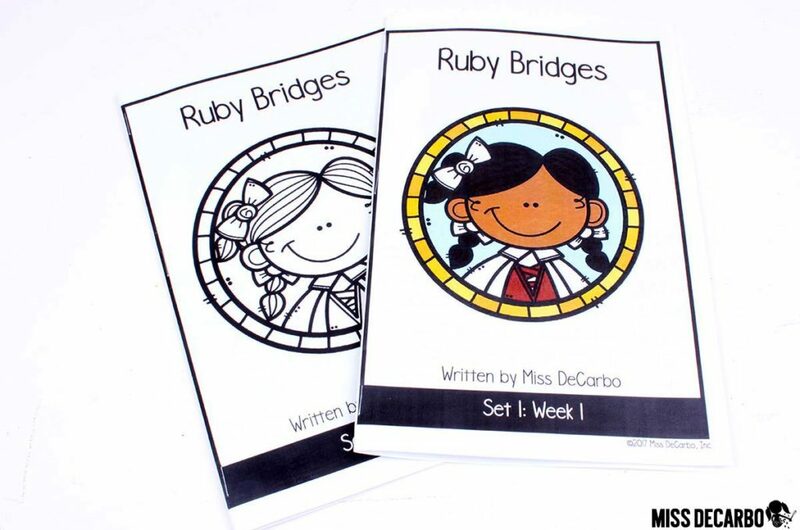 Simply read each page to your class and give them a couple minutes to illustrate the page. 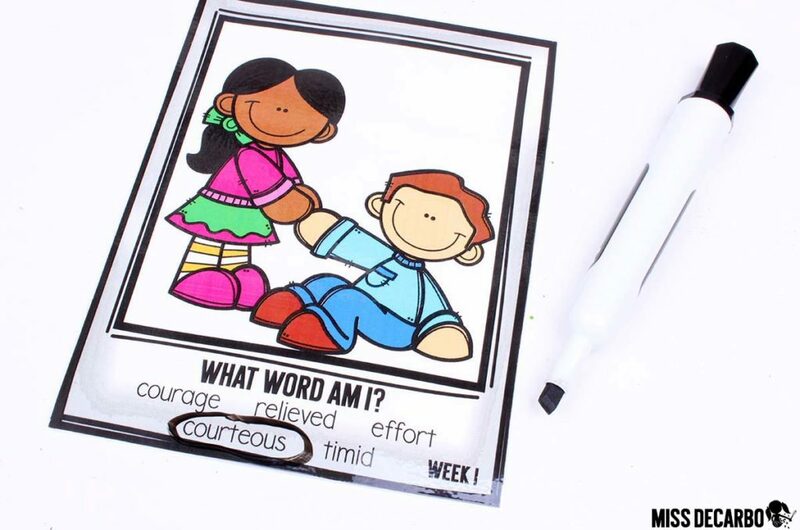 Each page’s illustration activity will require them to apply the focus words for the week. You can see that on page one of the book above, the sentence is I feel joyful. So, your students will draw a picture of themselves that shows they are joyful! To do so, they’ll need to know that joyful means happy. This is easy and FUN! Day 3 is all about synonyms and antonyms! “Aren’t these words too hard for kindergarten though?” No way! Remember, we are NOT expecting our kindergartners to take a test on all of these words. We’re not expecting them to read them independently or cite each word’s definition, origin, or part of speech at this age. We are exposing them to the words and providing an amazing opportunity to directly and explicitly hear, see, learn, and use the words. 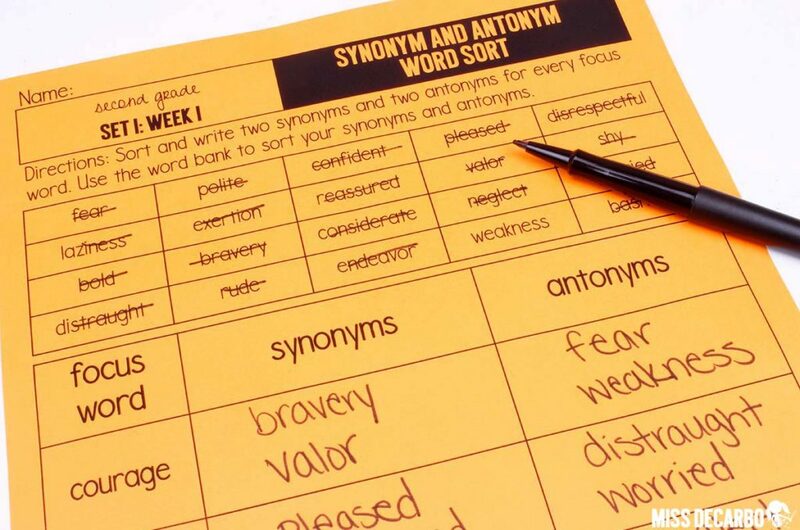 By teaching just two synonyms and antonyms for each focus word, you can easily see that your students are being exposed to upwards of 12 additional words each week when we teach synonyms and antonyms. Here’s a quick teacher-lesson: You know there are a lot of varieties of dogs right? The Dalmatian you saw when you were 3 years old is just ONE kind of dog. Imagine if a Dalmatian was the ONLY dog you were ever exposed to, saw, or read about throughout your life. Now (enter how many years old you are) later, imagine you read a book about a Siberian Husky. Since you were never exposed at all to any other kinds of dogs besides a Dalmatian, you are utterly clueless about what a Siberian Husky is. We know by now that it is SO important to provide opportunities that let students practice, see, and use words within multiple contexts. One activity I like to do is to bring back the short introduction passage you used on Day 1. You’ll repeat the lesson plan, but instead, you’ll use synonyms and antonyms for the week’s words instead of the focus words! 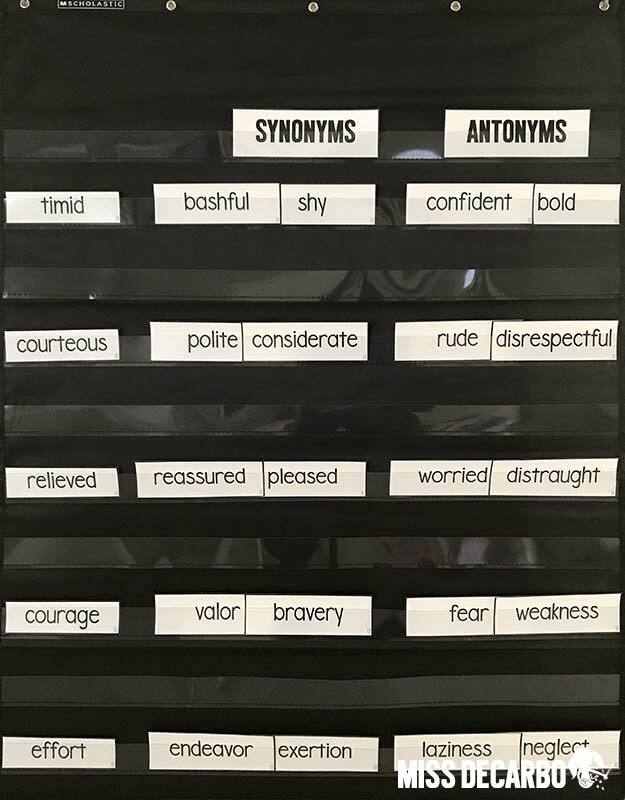 Your students will have SO much fun picking and choosing synonyms and antonyms (with your leadership and guidance) for each blank space. Sometimes, this turns the stories into super SILLY stories and it is so much fun! You can see above, I’ve replaced the same story from Day 1 with synonyms and antonyms instead of the focus words. The story STILL makes sense AND my kids are now able to see the connection between the various words. Plus, it’s EASY! Day 4: Word Play Day! Word play is an opportunity for your students to interact with words in a different way – through song, chant, games, drama, puzzles, art, and movement. Word play also leads to word consciousness – being curious about new words and willing to take risks with new words. Word play allows your students to try out and think about words in a multi-sensory way. Plus, it’s FUN and boosts engagement. 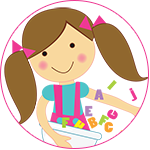 Within each Kindergarten Vocabulary Curriculum set, you’ll find a Word Play Menu. On Day 4, you’ll pick and choose a word play activity off of the menu. Each set will come with 2-3 new word play activities to choose from. So, Set 1 has three activities on the menu. When Set 2 is released, the word menu will include those same three activities, plus 2-3 new ones to choose from. As you can see, your Word Play Menu will continue to grow throughout the year! Word Chat is a higher-order thinking activity that uses illustrations for each word. It can be completed within a whole group setting, in a small group, or within a learning center. You are your students will have a discussion about each picture card. On the bottom of the card are the week’s focus words. Your students will work together or discuss which word the picture best describes, portrays, or shows. 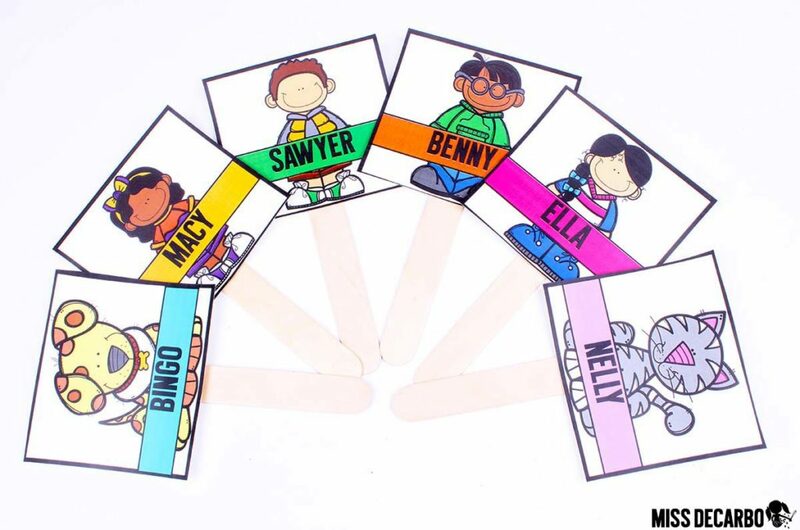 You can either laminate the cards and circle the word with a dry erase marker (as pictured above) or match the picture cards and the word cards using your pocket chart (as pictured below). 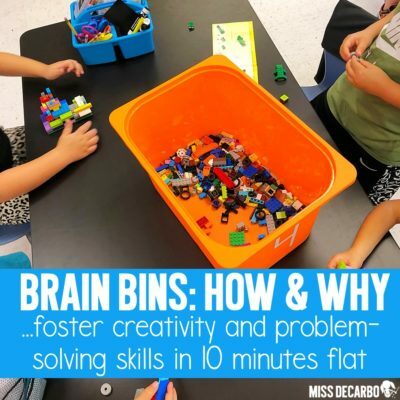 This activity sparks SO much discussion, rationalizing, reasoning, and critical thinking skills. Truly, you will LOVE it! I intentionally did not include an answer sheet for this activity because we want students to form their own conclusions, opinions, and justifications about which picture best matches the meaning of each word. If we, as teachers, “assign” pictures and illustrations to Tier 2 words, we limit our students’ thinking because they may only associate the word with the picture on the poster that their teacher used to introduce the word. Word chat encourages critical and creative thinking and requires the students have to USE their understanding of the word in order to make a match. Word Theater: Word Theater is a really fun word play activity to choose from for Day 4! Your students can work in small groups or in partners for this activity (I prefer partners, as I think it’s just easier to manage and allows for more participation.) Students can choose a character stick and orally create a story or a “play” that uses the week’s focus words and/or synonyms and antonyms. 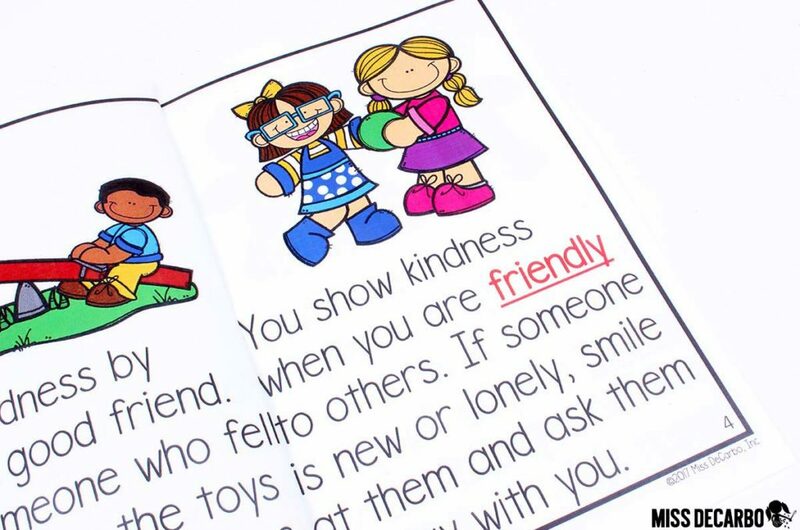 The Kindergarten Vocabulary Curriculum also includes a blank template so that your students can draw and color themselves or other people they know as character sticks! This activity encourages students to use the words on their own and practice what they sound like in conversational speech. Tip & Trick: For students who may struggle with coming up with their own “story” or play orally, invite them to re-create the week’s digital book and simply “act it out” while they use the week’s words. This will allow them to have fun, stay creative, use the words, and still be challenged in a fun way! 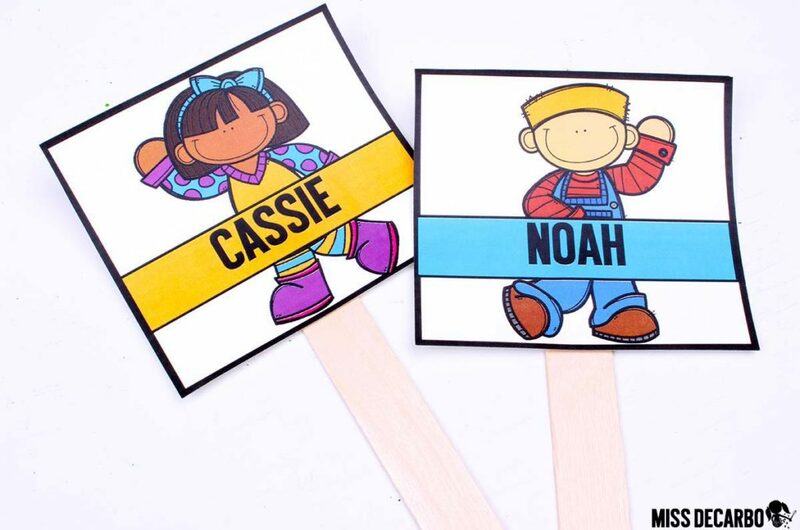 In Sets 2, 3, and 4, you will see character sticks with new kids and characters, so that this activity always stays “fresh”! 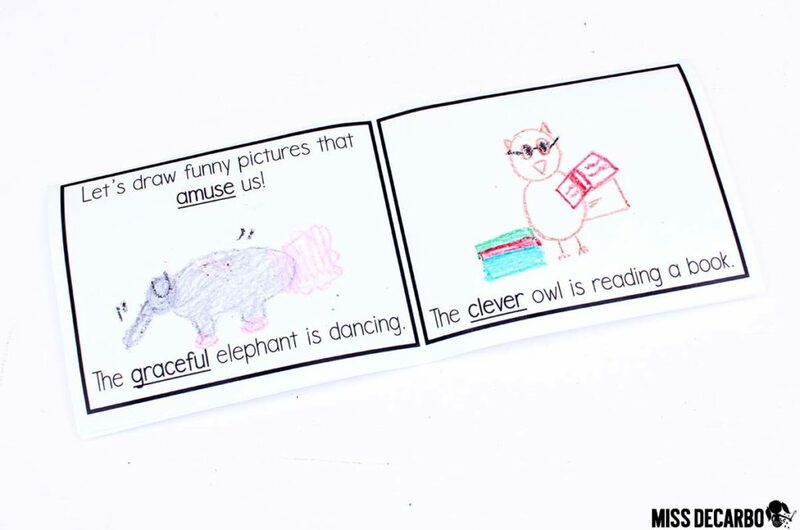 Other Word Play Activities: Set 1 also includes a really cute and simple “chant” that you can choose from to practice synonyms, antonyms, and definitions for the week’s words. Future packs will include activities such as games, drama activities, additional chants/cheers/songs, and so much more! Day 5: Application Day: I Can Draw a Story! In the prompt below, the students are asked to think about a time when they were proud of themselves. The “I Can Draw a Story” activity encourages students to apply the focus words to their own lives and orally share their story “in their own words” using the illustrations. Students who can orally tell stories and draw pictures for their stories are developing essential beginning writing skills, logical thinking and sequential thinking skills, oral language, and an understanding of plot and events. 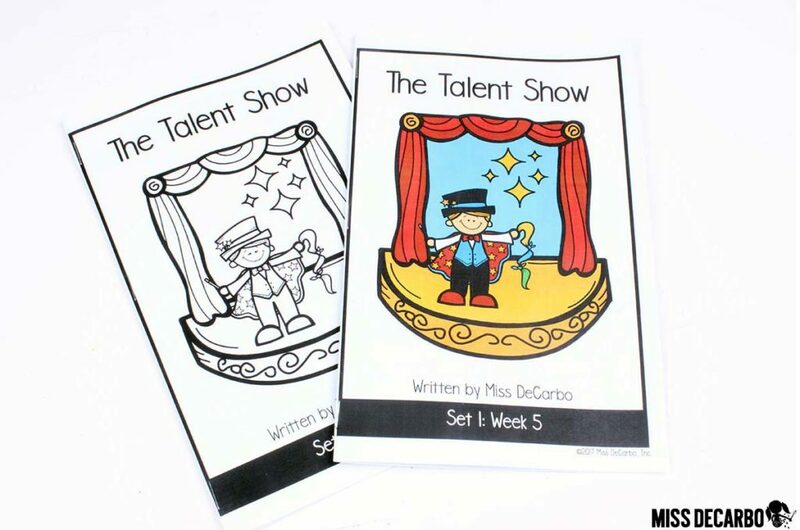 The curriculum is set up to take the students’ natural development into play, so as the sets continue to be available, differentiated pages for Day 5 will be added, including writing lines. 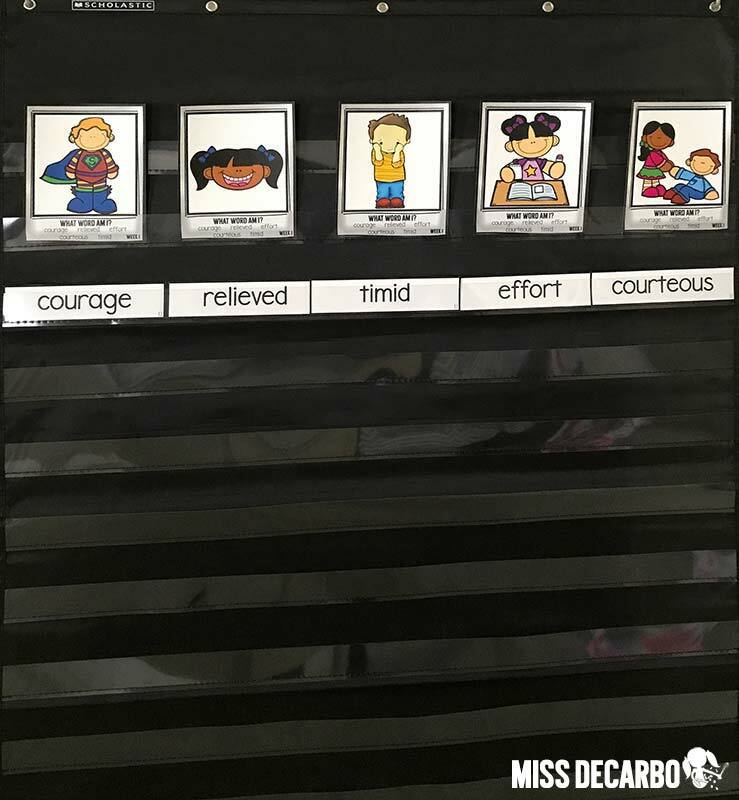 Differentiation: Depending upon the time of the year, and your students’ individual skills, encourage students to write the week’s focus words and label their picture. You can also have students cut and glue the week’s words to label their picture if you choose. In the photograph above, this kindergartener told a story about a time that she sang at church on stage. She was proud of herself for getting on stage. She also felt joyful as she was singing! What else is included in the curriculum? •Optional Quick Sketch Assessments are included each week. These can be used to assess your students’ understanding of the words, or, used as an additional activity. •Label the Photograph printable – This activity is a printable version of the “Word Chat” activity and can even be used as an assessment. The students will cut, label, and glue a word to each picture that he or she believes best shows the word’s meaning. 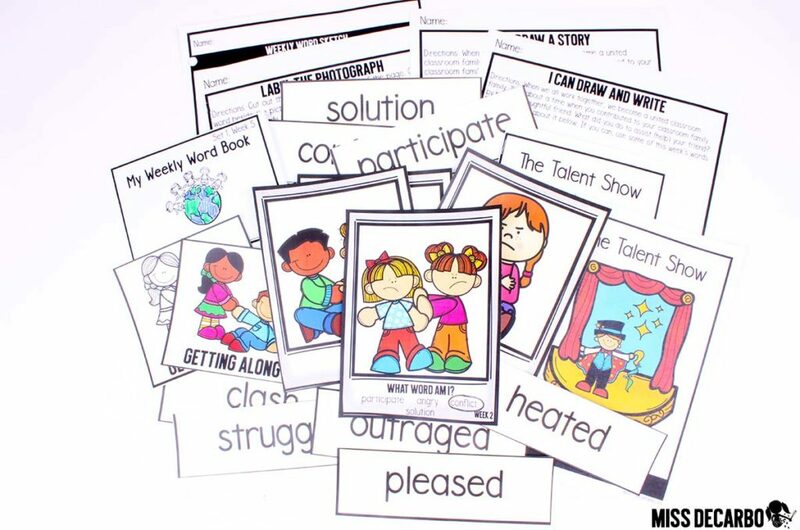 •Vocabulary Word Cards – Use the word cards on a Vocabulary Word Wall within your classroom to show off all of the great Tier 2 words you and your students are learning, or, use them in personal vocabulary notebooks. First Grade Vocabulary Curriculum: Our first graders’ reading progress explodes in first grade. We want so badly to raise their fluency and comprehension skills that we often don’t PLAN for vocabulary lessons throughout the week. 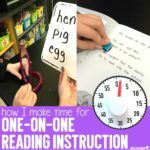 It’s easy to find engaging and hands-on comprehension lessons for our mini-lessons and fluency strategies to get our firsties blending and reading and a smoother pace. But where does vocabulary fit in? We can’t rely on the books the STUDENTS read at the small group table. The vocabulary simply isn’t rich enough, varied enough, or rigorous enough -and, let’s face it – it shouldn’t be. For a Level D student who is focusing on gaining independent reading skills while I provide guided reading instruction, I don’t want a book that is packed with words that are far too difficult for the child to decode, such as courage, relieved, acceptable, and unique. Those are great Tier 2 words, but you won’t see them in a Level D book. We can certainly expose our students to Tier 2 words during the picture books we read (and we should be doing this) but like we just talked about above, that isn’t enough. Students need explicit, direct, and intentional vocabulary instruction that lets them interact with the words – not just hear them during a read aloud. If we wait until we think our students can read independently before we really give them strategic vocabulary instruction, we are doing those sweet babies a HUGE disservice in so many areas of their learning and lives. If we wait too long to give direct vocabulary instruction, students enter the reading world and join other students’ who have already fallen so far behind in the vocabulary gap. Then, their third, fourth, fifth-grade teachers and beyond start to play a really exhausting game called “catch-up” when it comes to vocabulary development and the effects it has on reading comprehension. Hear me out because I’m about to use my teacher-voice: Your first graders are FULLY CAPABLE of learning tons and tons and tons of Tier 2 vocabulary, understanding it, using it in conversation and in life, and applying it. Will they be able to read the words independently? Probably not, but that’s not our goal for this program, or right now. Our goal is to expose our students to vocabulary (while providing rich application and instruction) so that our students are NOT the ones that fall into that gap as they get older. They are the ones that THRIVE because we were intentional in knowing this is a skill that every child needs and deserves. If they are intentionally learning how to use new vocabulary within their conversations, discussions, and real life situations, they will also increase their reading comprehension skills and later, be able to use these words within their writing. Simply put? Putting time and focus on vocabulary instruction is ALWAYS worth it. How can I teach vocabulary in first grade? In first grade, we’re going to teach vocabulary DAILY and we’re going to make it rich in oral language participation, teacher read-alouds, fun word play activities, playful interactions with the words, and TONS of opportunities to learn how Tier 2 words work within their everyday lives so that they can be exposed to robust words that they will utilize for years to come. 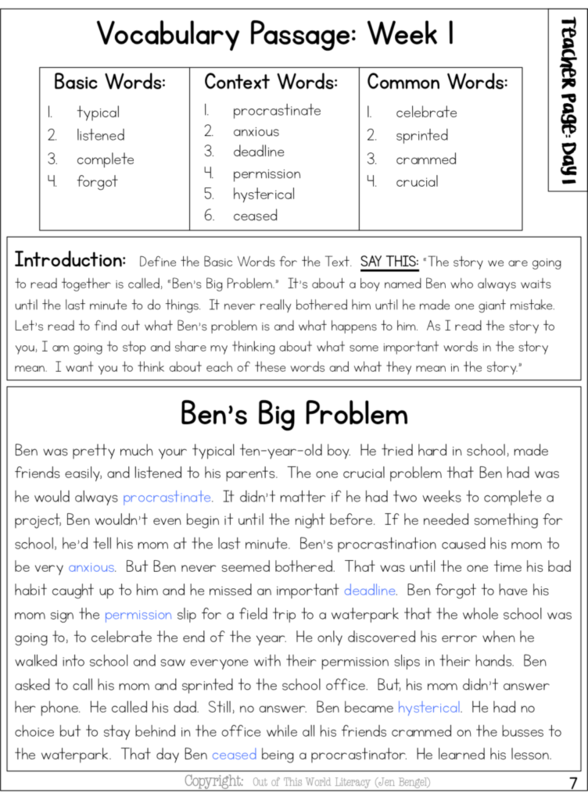 Let’s take a look at the first-grade weekly vocabulary routine! 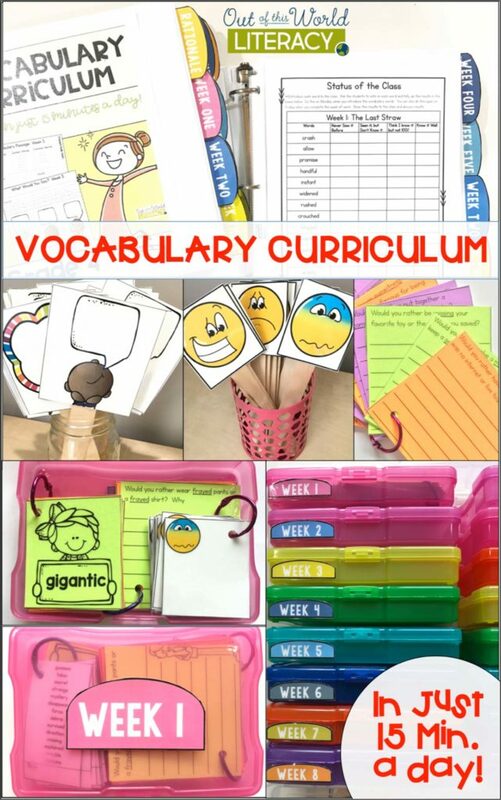 The First Grade Vocabulary Curriculum is divided into quarterly sets. Each set covers eight weeks of instruction. Why eight and not the standard nine weeks? We want this curriculum to be flexible and REAL for teachers. Let’s face it. You’re not going to launch yourself into a vocabulary routine the first week of school. You’re going to need some days off during the last week of school. You’re going to want to spend some time enjoying holiday activities in December. Eight weeks provides you with the flexibility to be a real teacher who has real interruptions that happen in the school-week! Pretty fantastic, right?! A Weekly Vocabulary Routine for Firsties! 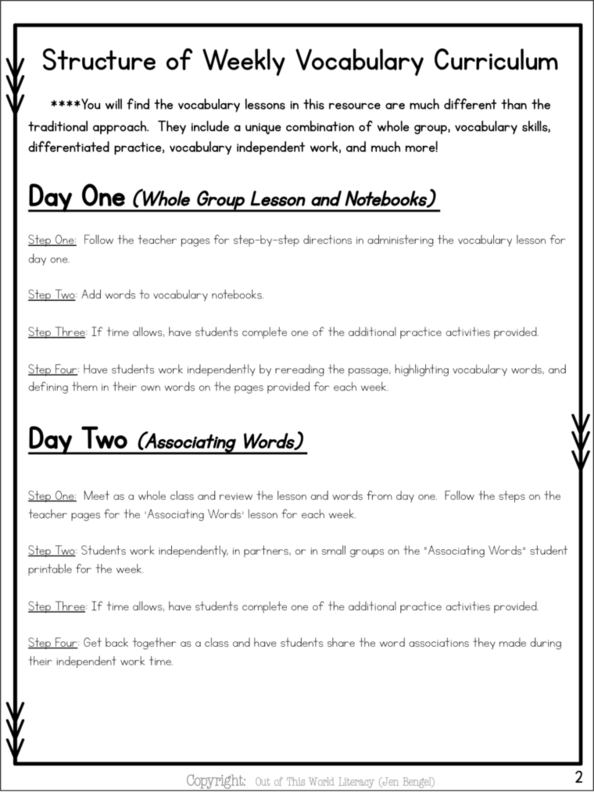 Each week comes with an At-A-Glance Weekly Guide and a Teacher Word Guide. The Weekly Guide will give you a quick snapshot of your routine for the week. Every week is consistent, but this is a nice page to slip into your lesson plan binder. You’ll see a weekly theme, four focus words, and a snapshot of each day’s lesson. On the Teacher Word Guide, each focus word for the week includes a kid-friendly definition that you can use, an example sentence for your anchor chart (if you want to create one), and a list of synonyms and antonyms that you are encouraged to expose your students to and discuss throughout the week. If the word contains a multiple meaning, that information is provided, too! 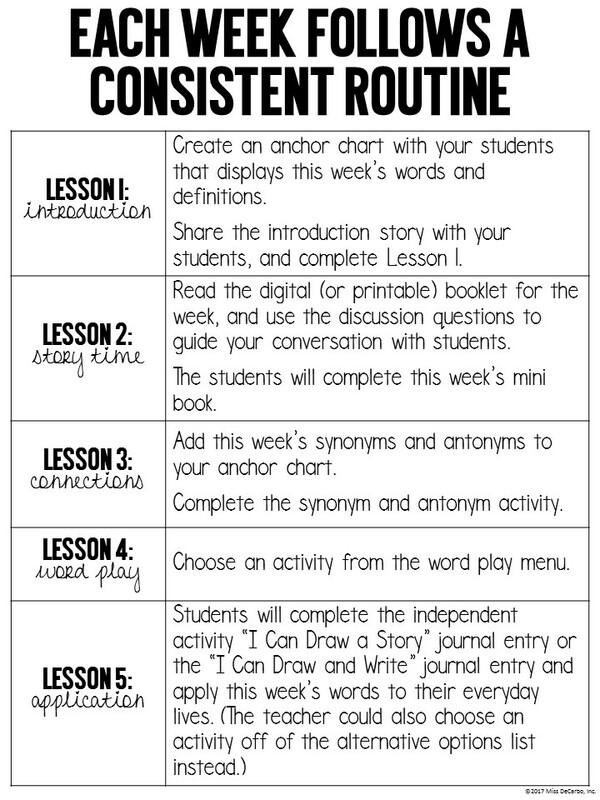 I have developed 5 “Master Lesson Plans” for the weekly routine. This is the magical part of this first grade vocabulary curriculum. You can rest assured that your weekly routine is consistent enough for students – and teachers – to feel confident in what they will do and what to expect each day. Each day’s lesson for the week follows one of the Master Lesson Plans – the only thing that changes is the focus words each week! Within the Master Lesson Plans, I have also provided optional “alternatives” and ideas to swap out if you are someone who wants and chooses to “mix it up” each week or every few weeks. The lessons provide detailed instruction, but the weekly routine has been set up to allow flexibility for you. You can truly make this “your own” if you wish, or, you can stick with my weekly suggestions. On Day 1, we’ll do a quick “Word Prediction” activity before we introduce the week’s words. You can choose to write the week’s introduction story (It’s only about 4-5 sentences. It’s SHORT!) 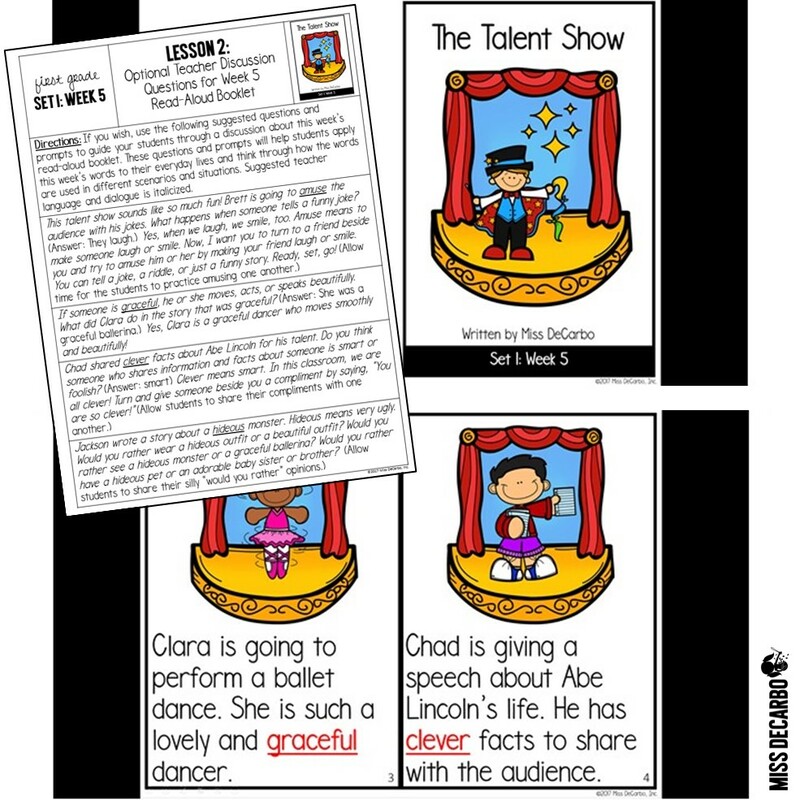 on sentence strips and use a pocket chart to make the activity interactive, or, you can use the provided introduction passage printable and simply project it onto your screen. (There’s no need to write out the passage if you do not want. I prefer to use a pocket chart because I like the kids to be able to physically move the words around and interact with the story, but you can simply project the passage printable if you’d like and cover the words up with a sticky note.) Before I show my students the words, I read the entire short passage to them. I say “blank” when I get to a blank. 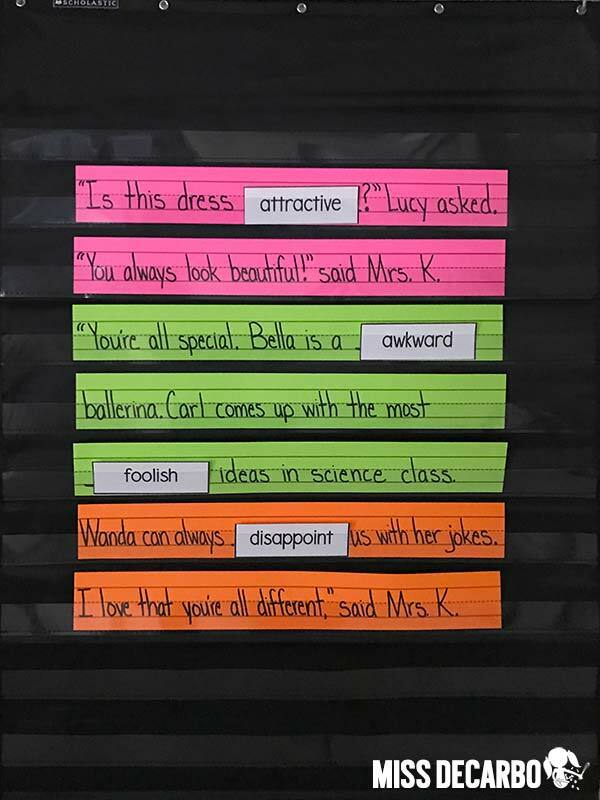 Then, I read the first sentence and ask the students, “What word COULD make sense in this sentence?” For the passage below, they may say things like “Is this dress beautiful?” or “Bell is a great ballerina.” This is showing me if they are understanding the general context of the story or not, even if the words they are predicting aren’t the words of the week. It helps students to start to think about what the passage is about and what is happening within the story. This only takes 2-3 minutes to do. Simply read the passage again and call on various students to share their word predictions. Now, we will flip the four focus words over and introduce them to the students. Say the first word and have your students repeat the word back to you. After asking the students to share what they think the word means, share the kid-friendly definition with them. Repeat this process for each of the three focus words. This, again, will take just a few minutes of your time. After you have introduced the words to the students, it’s time to put them into context! Read the passage again with the students, and stop after each sentence or “blank.” As the children to help you decide where each word fits within the passage. This is your typical “cloze activity.” Cloze concepts are really important to vocabulary instruction at the primary level. It helps students to understand how to use sentence-level context to decipher and understand the meaning of words and phrases. This is the beauty of this vocabulary curriculum – we are never teaching words in isolation. We are ALWAYS teaching words within the context of the text and real-life application. The discussion will take about 8 minutes, bringing your total estimated time (this varies according to the time of the year) to only about 15 minutes for Day One! A full page of Optional Teacher Discussion Questions for the introduction passage is provided for your class discussion. This is completely optional, but I highly encourage it because it is truly the MEAT of the program. During your discussions about the passage, you and your students will have rich conversations about the words, apply it and use it in real-life situations, and play valuable word games that encourage the students to not just hear the meaning of the words but use them and learn how they connect to their real world. On Day 2, you and your students will enjoy a read aloud that uses the focus words again, but this time, in a completely different context. You see, want our students to not just hear, read, and talk about words in context, we want them to be able to apply those words in many different situations and experiences. It doesn’t do us any good if our students can only apply the four new words they just learned to stories involving a pet shop just because that’s the story they first learned the words with. Day 2 will provide instruction in the week’s words again, providing that repeated exposure, while helping them to make connections to new scenarios and life experiences. 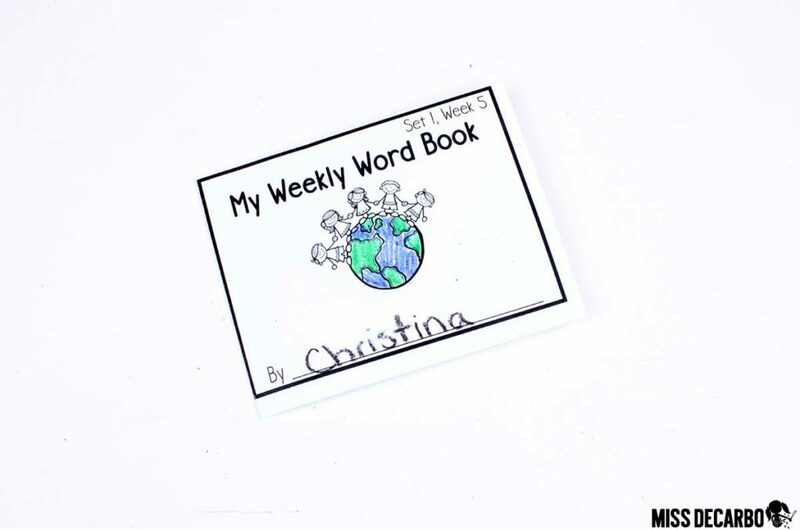 After you read the book aloud and have your vocabulary discussion, your students get to apply the words to their own lives with their My Weekly Word Book! You can do this after your read aloud on Day 2, or, you could certainly do this book on Day 3 if you’d prefer. It is really easy and doesn’t take much time at all! Let’s take a look at an example of a Weekly Word Book that is in Week 5 of the First Grade Vocabulary Curriculum for Set 1. You simply read each page to your class and give them a couple minutes to illustrate the page. 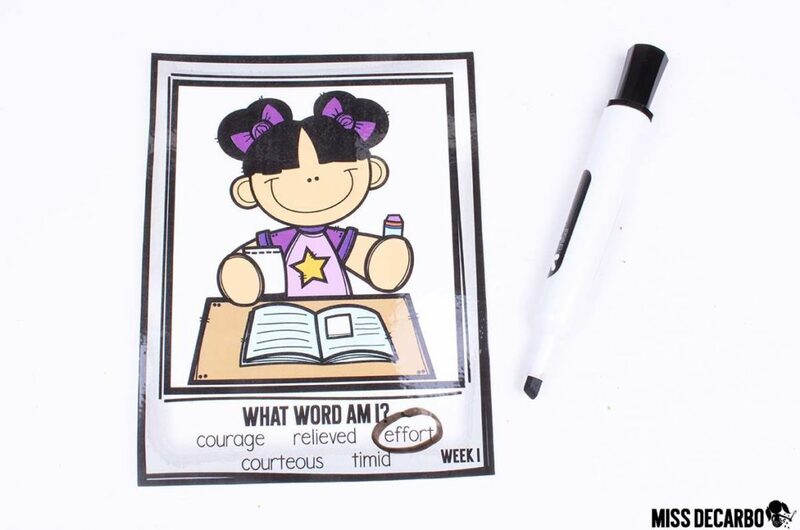 Each page’s illustration activity will require them to apply the focus words for the week. You can see that on page one of the book above, the students are creating a silly and fun story, while still having to apply the words’ meanings. Most of the books will have the students apply the words to their own lives, both in and out of school. This is easy and FUN! As the year progresses, the mini-books will have the students start to write in the mini-book. In Sets 3 and 4, many pages will require the student to “finish the sentence” or write and fill in a section of the sentence. Day 3 is all about synonyms and antonyms! “Aren’t these words too hard for kindergarten though?” No way! Remember, we are NOT expecting our kindergartners to take a test on all of these words. We’re not expecting them to read them independently or cite each word’s definition, origin, or part of speech at this age. We are exposing them to the words and providing an amazing opportunity to directly and explicitly hear, see, learn, and use the words. By teaching just two synonyms and antonyms for each focus word, you can easily see that your students are being exposed to upwards of 16 additional words each week when we teach synonyms and antonyms. Each focus word for the week comes with four additional word cards: two synonyms and two antonyms. 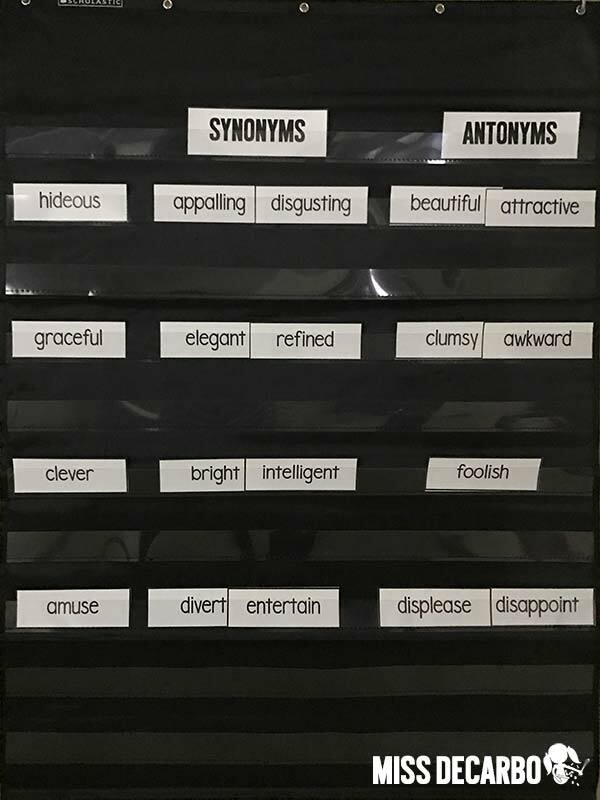 On Day 3, expose your students to as many – or as few – synonyms and antonyms as you would like by sorting the cards in a pocket chart. (You could also sort them on an anchor chart, on the floor, under your projector, or on a whiteboard using magnets.) Day 3 comes with a fully detailed Master Lesson Plan that guides you through this activity. You can see the full word sort below. It should only take about 15 minutes to quickly read, discuss, and sort the synonyms and antonyms with the class. This is a quick but effective lesson that allows your students to learn additional words that they can apply to the stories and passages this week. You can also share example sentences for each synonym and antonym if you’d like! 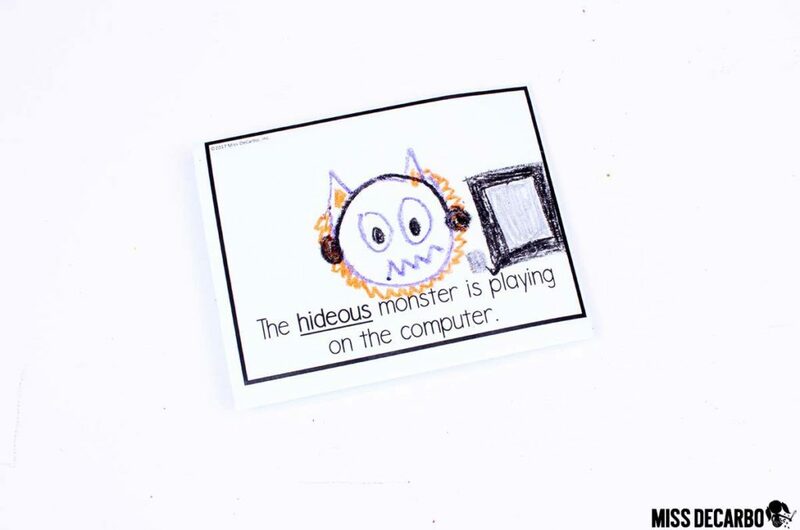 Within each First Grade Vocabulary Curriculum set, you’ll find a Word Play Menu. On Day 4, you’ll pick and choose a word play activity off of the menu. Each set will come with 2-3 new word play activities to choose from. So, Set 1 has three activities on the menu. When Set 2 is released, the word menu will include those same three activities, plus 2-3 new ones to choose from. As you can see, your Word Play Menu will continue to grow throughout the year! Word Theater: Word Theater is a really fun word play activity to choose from for Day 4! Your students can work in small groups or in partners for this activity (I prefer partners, as I think it’s just easier to manage and allows for more participation.) Students can choose a character stick and orally create a story or a “play” that uses the week’s focus words and/or synonyms and antonyms. 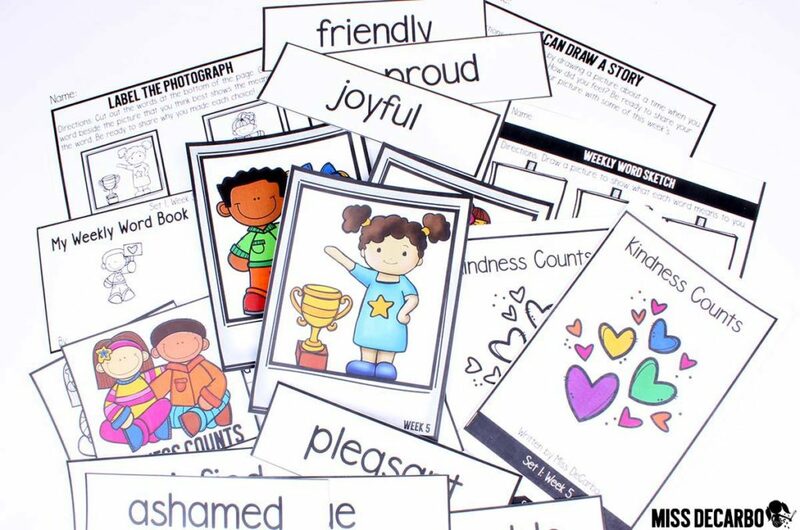 The First Grade Vocabulary Curriculum also includes a blank template so that your students can draw and color themselves or other people they know as character sticks! This activity encourages students to USE the words on their own and practice what they sound like in conversational speech. Day 5: Application: I Can Write a Story! Day 5 is all about applying the new words we’ve learned this week. It also provides students with the opportunity to practice the words independently. Each week for Day 5, you’ll choose a writing printable. 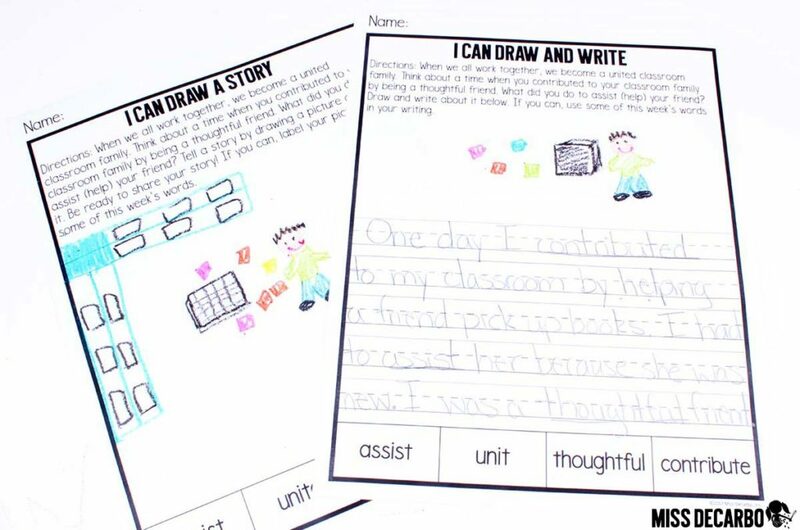 In first grade for Set 1, two differentiated versions that are included with your materials: “I Can Draw a Story” or “I Can Draw and Write.” This activity is similar to a journal entry. The teacher will read the prompt for the day aloud to the students, and you may choose to have a discussion about it with the class. I recommend modeling this activity as a whole class for several weeks using an anchor chart before the students head off to complete their own copies. In the prompt below, the students are asked to think about a time when they contributed to their classroom family by being a thoughtful friend at school. 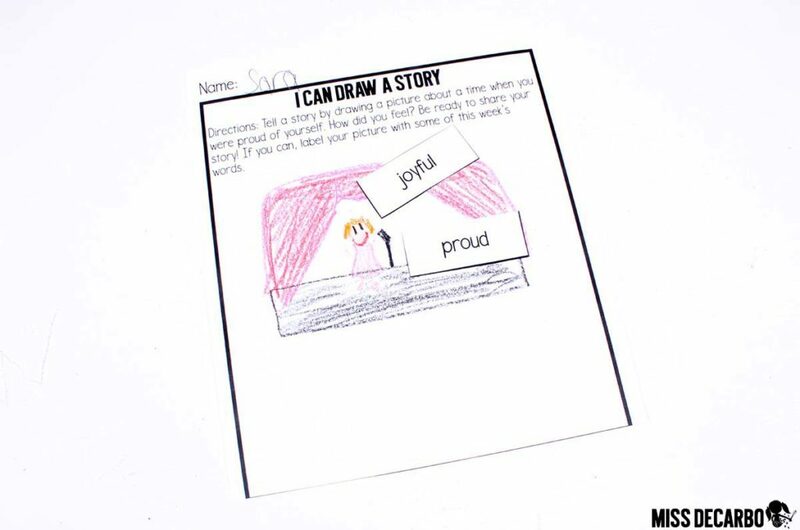 The “I Can Draw a Story” activity encourages students to apply the focus words to their own lives and orally share their story “in their own words” and through the illustrations they draw. 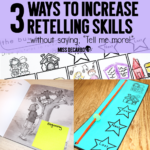 Students who can orally tell stories and draw pictures for their stories are developing essential beginning writing skills, logical thinking and sequential thinking skills, oral language, and an understanding of plot and events. Or, you can choose to have your students complete the “I Can Draw and Write” template, which asks students to draw AND write about their response. 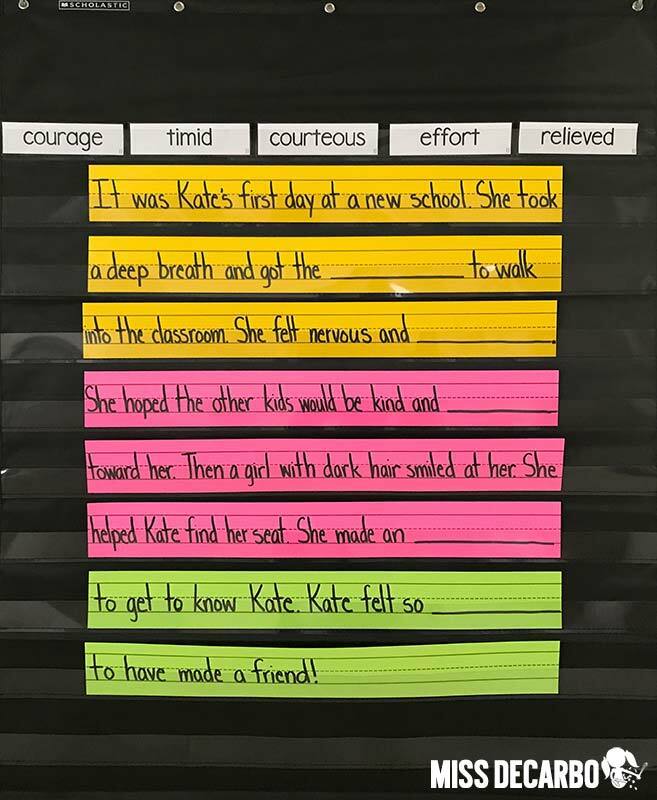 Start in Set 2, the First Grade Vocabulary Curriculum will also include an alternative option to Day 5 called “Finish the Sentence.” In this activity, the students will complete sentence stems using the week’s focus words. Each lesson within the curriculum takes about 15-20 minutes, so it’s easy to fit into your schedule. As you have read, there are so many times throughout the week that you can swap an activity out with something else, so you can truly “make it your own” and utilize it to fit the needs of your class, teaching style, student needs, and schedule. 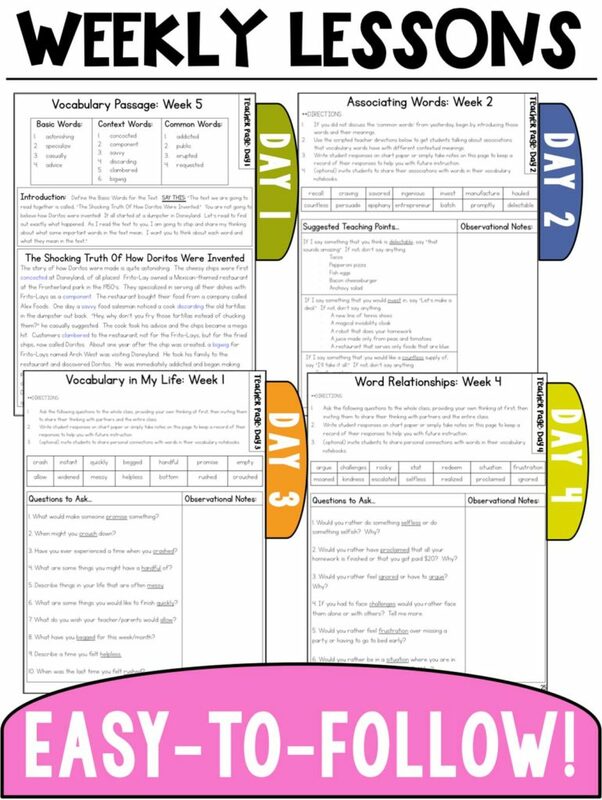 If you don’t have the time to do this vocabulary routine five days a week, you could also fit it into three days a week by completing the lessons for Day 1 and 2, and picking an activity from Days 3-5 for your classroom to complete. It’s SO FLEXIBLE, and isn’t that really what every teacher needs in a curriculum?! 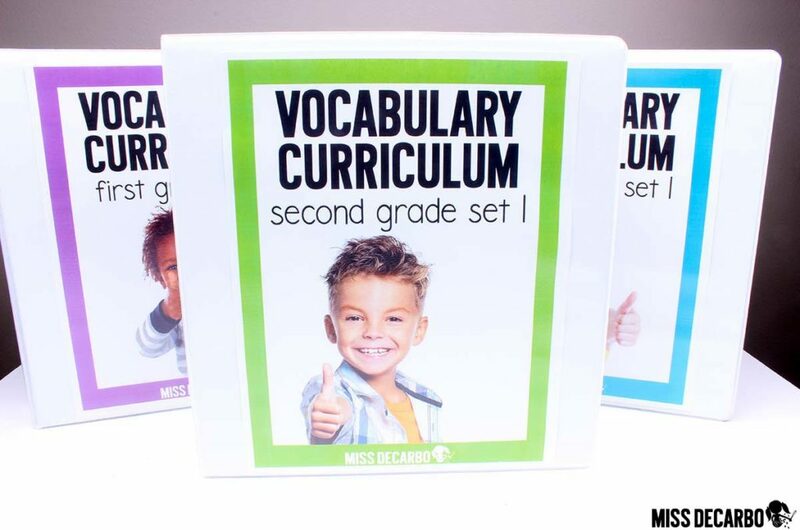 Second Grade Vocabulary Curriculum: It’s easy to find engaging and hands-on comprehension, phonics, and grammar activities and lesson plans for our mini-lessons. But where does vocabulary fit in? We can’t rely on the books the STUDENTS read at the small group table. The vocabulary simply isn’t always rich enough, varied enough, or rigorous enough. We also can’t be sure that every book will provide the consistency in the vocabulary words we are looking to teach and expose them to. We can certainly expose our students to Tier 2 words during the picture books we read (and we should be doing this) but like we just talked about above, that isn’t enough. Students need explicit, direct, and intentional vocabulary instruction that lets them interact with the words – not just hear them during a read aloud. 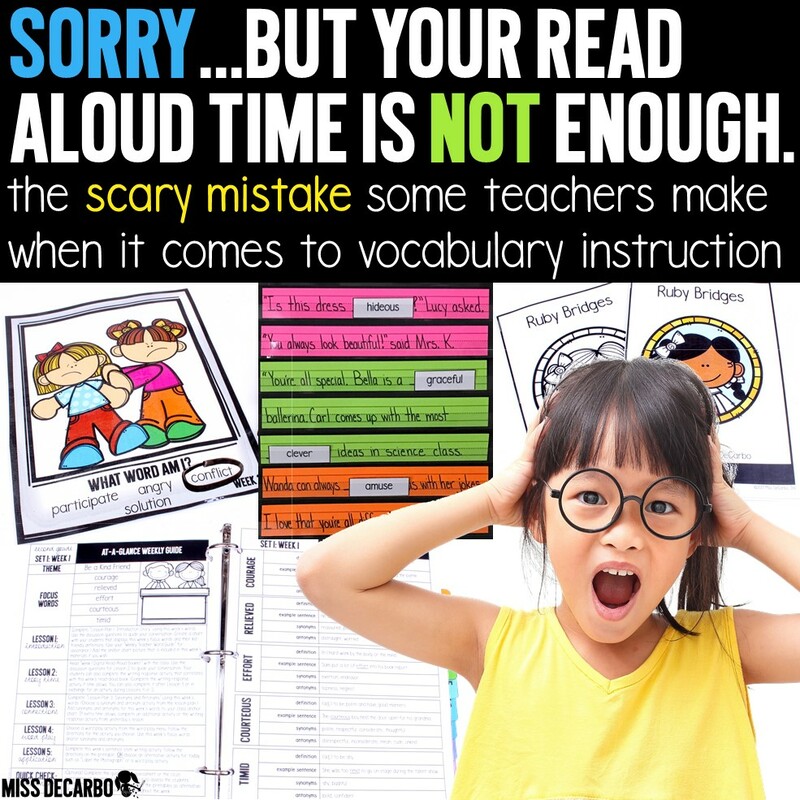 If we wait until we think our students can read independently before we really give them strategic vocabulary instruction, we are doing those readers a HUGE disservice in so many areas of their learning and lives. If wait too long, they enter the reading world and join other students’ who have already fallen so far behind in the vocabulary gap. Then, their third, fourth, fifth-grade teachers and beyond start to play a really exhausting game called “catch-up” when it comes to vocabulary development and the effects it has on reading comprehension. Hear me out because I’m about to use my teacher-voice: Your students – even your struggling readers – are FULLY CAPABLE of learning tons and tons and tons of Tier 2 vocabulary, understanding it, using it in conversation and in life, and applying it. Will they be able to always read the words independently? Not always, especially at the beginning of the year – but this isn’t an independent test or spelling test that we are striving to fulfill. Our goal is to expose our students to vocabulary (while providing rich application and instruction) so that our students are NOT the ones that fall into that gap as they get older. They are the ones that THRIVE because we were intentional in knowing this is a skill that every child needs and deserves. If they are intentionally learning how to use new vocabulary within their conversations, discussions, and real life situations, they will also increase their reading comprehension skills and later, be able to use these words within their writing. Simply put? Putting time and focus on vocabulary instruction is ALWAYS worth it. How can I teach vocabulary in second grade? In second grade, we’re going to teach vocabulary DAILY and we’re going to make it rich in oral language participation, passages, writing applications, teacher read-alouds, fun word play activities, playful interactions with the words, and TONS of opportunities to learn how Tier 2 words work within their everyday lives so that they can be exposed to robust words that they will utilize for years to come. 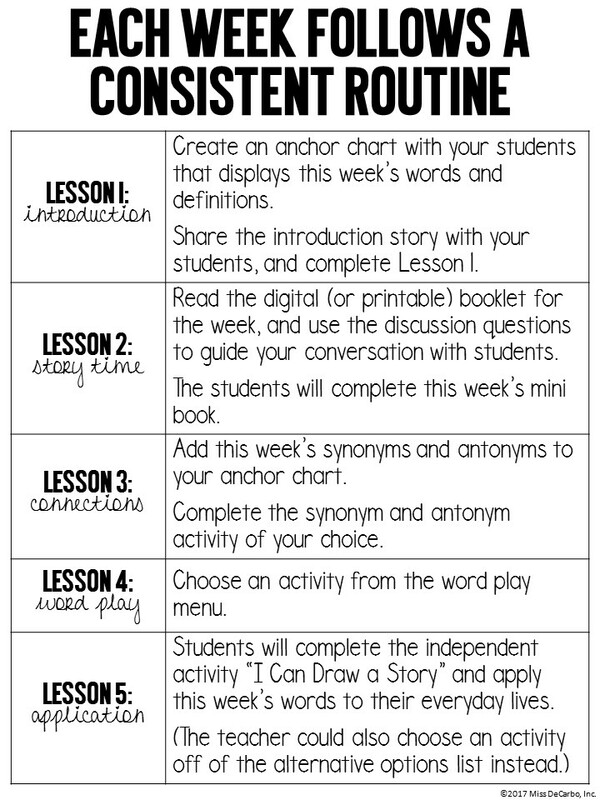 Let’s take a look at the second-grade weekly vocabulary routine! 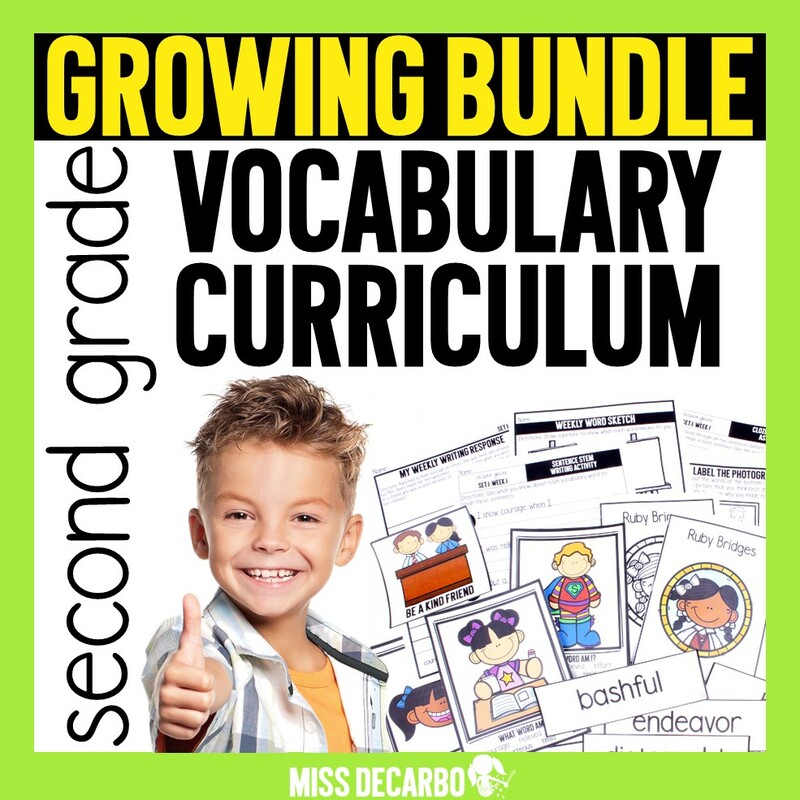 The Second Grade Vocabulary Curriculum is divided into quarterly sets. Each set covers eight weeks of instruction. Why eight and not the standard nine weeks? We want this curriculum to be flexible and REAL for teachers. Let’s face it. You’re not going to launch yourself into a vocabulary routine the first week of school. You’re going to need some extra time during the last week of school. You’re going to want to spend some time enjoying holiday activities in December. Eight weeks provides you with the flexibility to be a real teacher who has real interruptions that happen in the school-week! Pretty fantastic, right?! 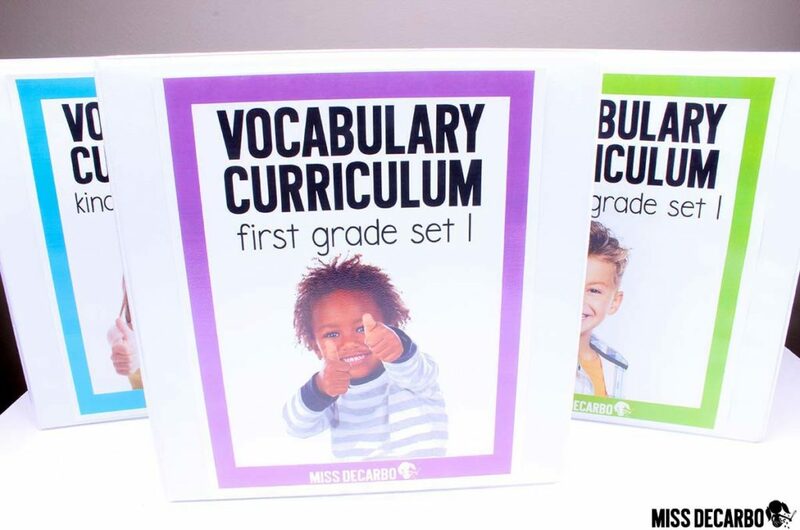 The second-grade vocabulary curriculum also includes some materials and lessons that differ from the kindergarten and first-grade vocabulary curriculum. After all, our students will be third graders next year-and we want to make sure they are ready! Additional and more rigorous vocabulary assessments, writing prompts, and a student synonym and antonym word sort are just some of the different pieces you’ll find within the second-grade program. Let’s dig in and get started! A Weekly Vocabulary Routine for Second Grade! 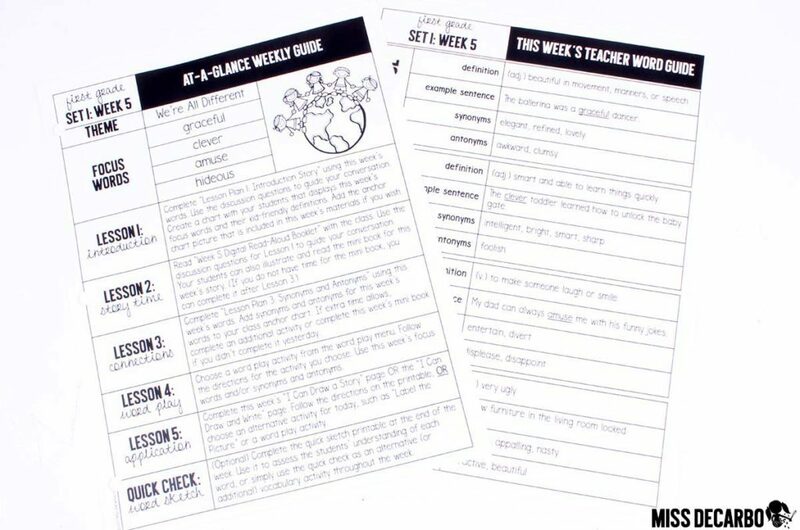 Each week comes with an At-A-Glance Weekly Guide and a Teacher Word Guide. (Pictured Below) The Weekly Guide will give you a quick snapshot of your routine for the week. Every week is consistent, but this is a nice page to slip into your lesson plan binder. You’ll see a weekly theme, five focus words, and a snapshot of each day’s lesson. 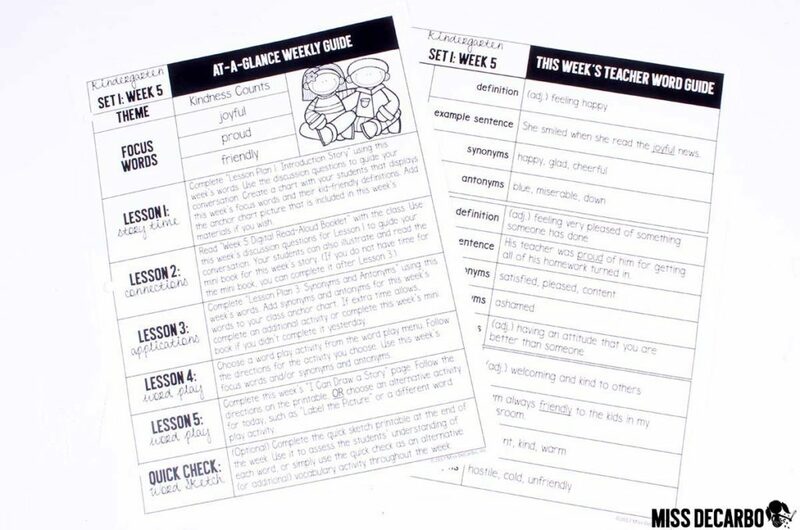 On the Teacher Word Guide, each focus word for the week includes a kid-friendly definition that you can use, an example sentence for your anchor chart (if you want to create one), and a list of synonyms and antonyms that you are encouraged to expose your students to and discuss throughout the week. If the word contains a multiple meaning, that information is provided, too. You may be wondering, “Where did the word lists come from?” Since we know that teaching words in isolation is not shown to be effective, these words came directly from the passages and stories that I wrote for the curriculum. These passages and books were strategically written to include appropriate and meaningful Tier 2 words that your students will see, hear, and read within real-life situations, conversation, and in texts. 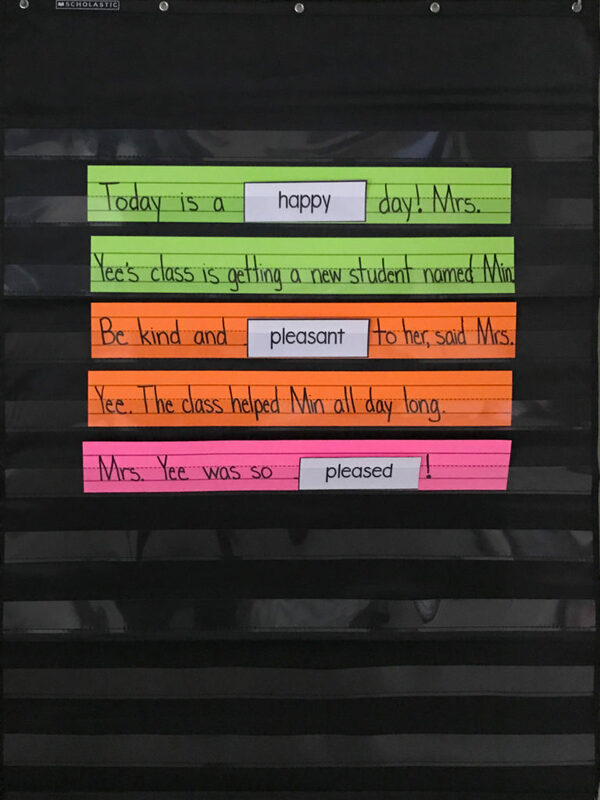 Even if you see a word on the lists that you think your students have heard before, I encourage you to honestly ask yourself: “Are they using the word in conversation on their own?” The chances are, your students have heard the word “relieved” before, but if they are like my students, most students are saying, “I’m happy that’s over with,” or “I feel better.” Are you hearing them say – on their own – “I feel so relieved that the test is over!” This vocabulary routine can change all of that! 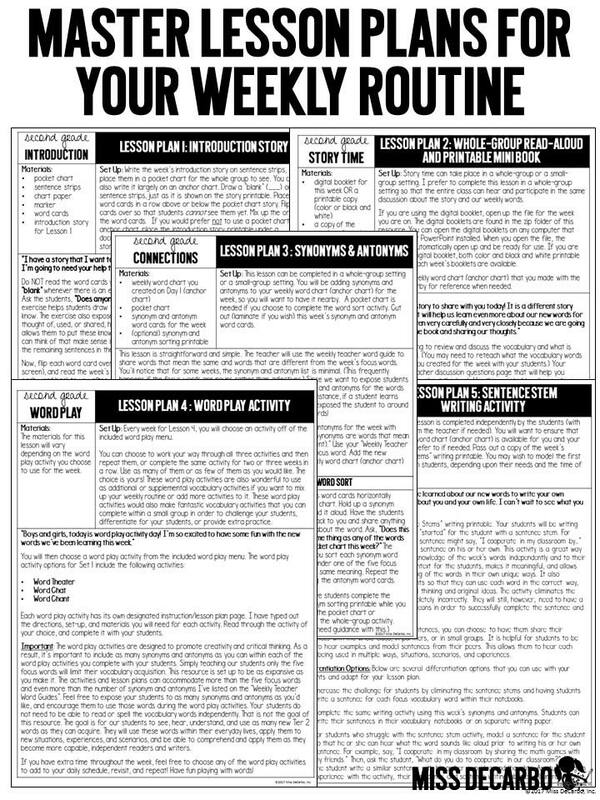 I have developed five “Master Lesson Plans” for the weekly routine to make your instruction simplified and organized. This is the magical part of this second-grade vocabulary curriculum. You can rest assured that your weekly routine is consistent enough for students – and teachers – to feel confident in what they will do and what to expect each day. Each day’s lesson for the week follows one of the Master Lesson Plans – the only thing that changes is the focus words each week! Within the Master Lesson Plans, I have also provided optional “alternatives” and ideas to swap out if you are someone who wants and chooses to “mix it up” each week or every few weeks. The lessons provide detailed instruction, but the weekly routine has been set up to allow flexibility for you. You can truly make this “your own” if you wish, or, you can stick with my weekly suggestions. On Day 1, we’ll do a quick “Word Prediction” activity before we introduce the words. 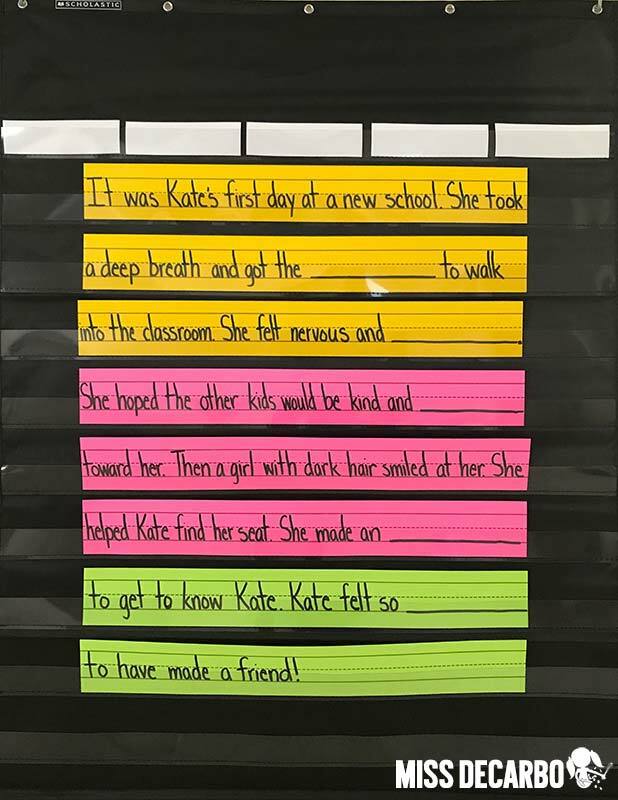 You can choose to write the week’s introduction story on sentence strips (It’s only about 5 sentences. It’s SHORT!) and use a pocket chart to make the activity interactive, or, you can use the provided introduction passage printable and simply project it onto your screen. (There’s no need to write out the passage if you do not want. I prefer to use a pocket chart because I like the kids to be able to physically move the words around and interact with the story, but you can simply project the passage printable if you’d like and cover the words up with a sticky note. The choice is yours!) There is also a student copy of the introduction passage within the second-grade program, so your students can follow along with you on their own copy of the passage if you prefer. Before I show my students the words, I read the entire short passage to them. I say “blank” when I get to a blank. Then, I read the first sentence and ask the students, “What word COULD make sense in this sentence?” For the passage below, they may say things like “She took a deep breath and got the nerve to walk into the classroom.” or “She felt nervous and excited.” This is showing me if they are understanding the general context of the story or not, even if the words they are predicting aren’t the words of the week. It helps students to start to think about what the passage is about and what is happening within the story and sets them up for great success since they are actively thinking about the characters and the events. This only takes 2-3 minutes to do. Simply read the passage again and call on various students to share their word predictions. Now, we will flip the five focus words over and introduce them to the students. Say the first word and have your students repeat the word back to you. After asking the students to share what they think the word means, share the kid-friendly definition with them. Repeat this process for each of the three focus words. This, again, will take just a few minutes of your time. A full page of Optional Teacher Discussion Questions for the introduction passage is provided for your class discussion. This is completely optional, but I highly encourage it because it is truly the MEAT of the program. During your discussions about the passage, you and your students will have rich conversations about the words, apply it and use it in real-life situations, and play valuable word games that encourage the students to not just hear the meaning of the words but use them and learn how they connect to their real world. You will also cover general comprehension questions and practice things like acting out the words, playing “would you rather” games with the words, and sharing examples of the new words. These discussion questions will really help your students interact with the focus words of the week and start to OWN them. On Day 2, you and your students will enjoy a read aloud that uses the focus words again, but this time, in a completely different context. You see, want our students to not just hear, read, and talk about words in context, we want them to be able to apply those words in many different situations and experiences. It doesn’t do us any good if our students can only apply the five new words they just learned to stories involving a pet shop just because that’s the story they first learned the words with. Day 2 will provide instruction in the week’s words again, providing that repeated exposure, while helping them to make connections to new scenarios and life experiences. Day 3 is all about synonyms and antonyms! “Aren’t these words too hard for second graders though?” No way! Remember, we are NOT expecting our second graders to take a reading or spelling test on all of these words. We’re not expecting them to read them to cite each word’s definition, origin, or part of speech at this age. We are exposing them to the words and providing an amazing opportunity to directly and explicitly hear the words and learn (and see) how they are used and connected to one another. You can easily see that even though there are only four focus words each week, by teaching just two synonyms and antonyms for each focus word, your students are being exposed to upwards of 25 additional words each week when we teach synonyms and antonyms. Each focus word for the week comes with five additional word cards: two synonyms and two antonyms. On Day 3, expose your students to as many – or as few – synonyms and antonyms as you would like by sorting the cards in a pocket chart. (You could also sort them on an anchor chart, on the floor, under your projector, or on a whiteboard using magnets.) Day 3 comes with a fully detailed Master Lesson Plan that guides you through this activity. You can see the full word sort above. It should only take about 15 minutes to quickly read, discuss, and sort the synonyms and antonyms with the class. This is a quick but effective lesson that allows your students to learn additional words that they can apply to the stories and passages this week. You can also share example sentences for each synonym and antonym, if you’d like! 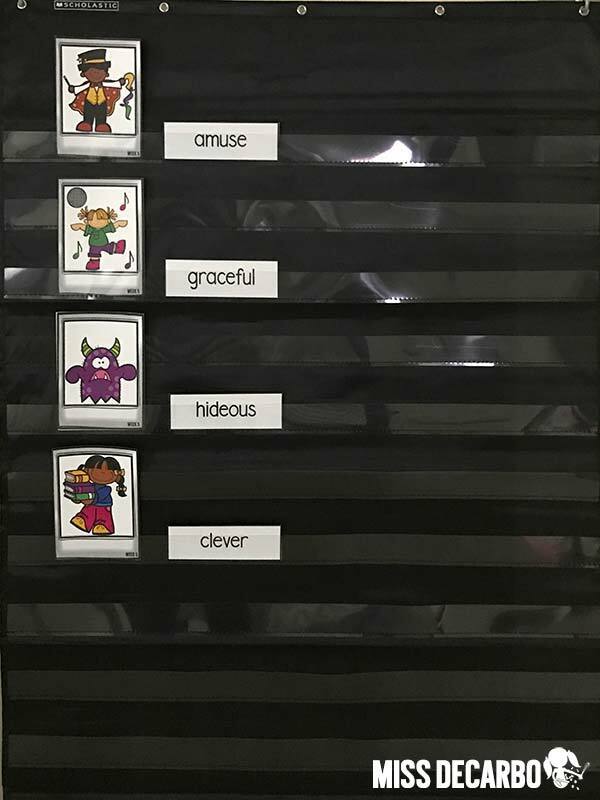 The second-grade vocabulary curriculum also includes a student copy or printable of the synonym and antonym word sort. 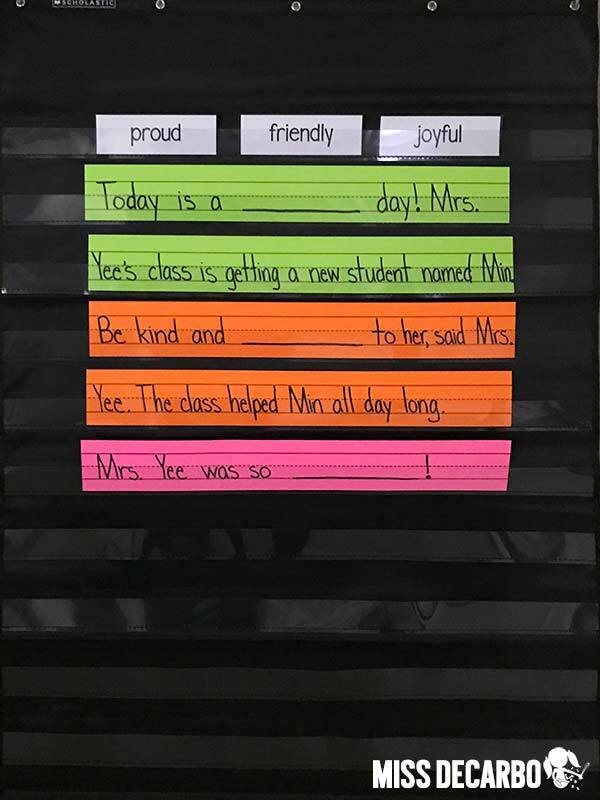 You can choose to use this if you want your students to follow along during the class sort and write the words into their chart independently. 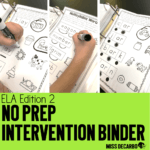 You could also use this as a follow-up activity during your small reading groups, as a literacy center throughout the day, or as an additional or alternative activity during Days 4 and 5. The Master Lesson Plan for Day 3 also gives you a couple of options for how you’d like to teach and expose your students to the synonyms and antonyms. An alternative option or activity for Day 3 is shown below. 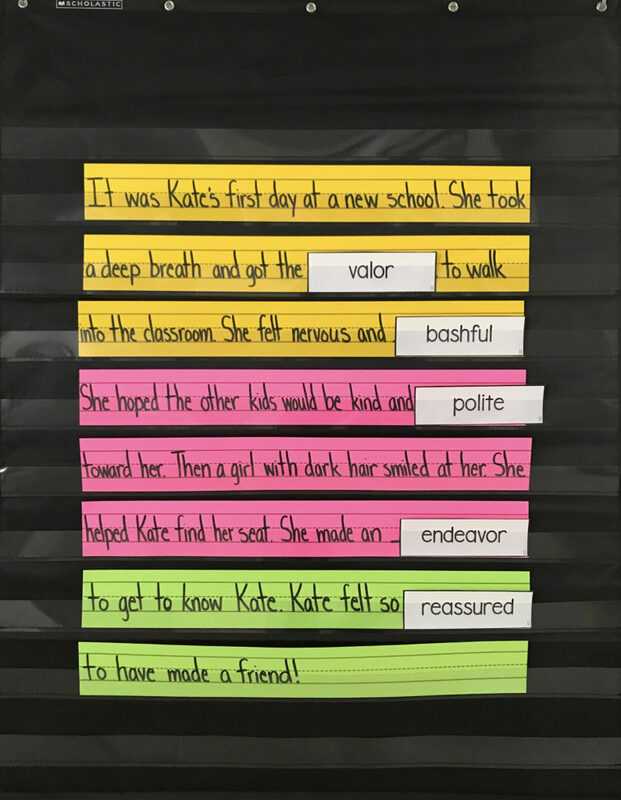 You can use choose to insert the synonyms and antonyms into the Introduction Passage and complete the cloze activity again, but with words that are connected to the focus words! 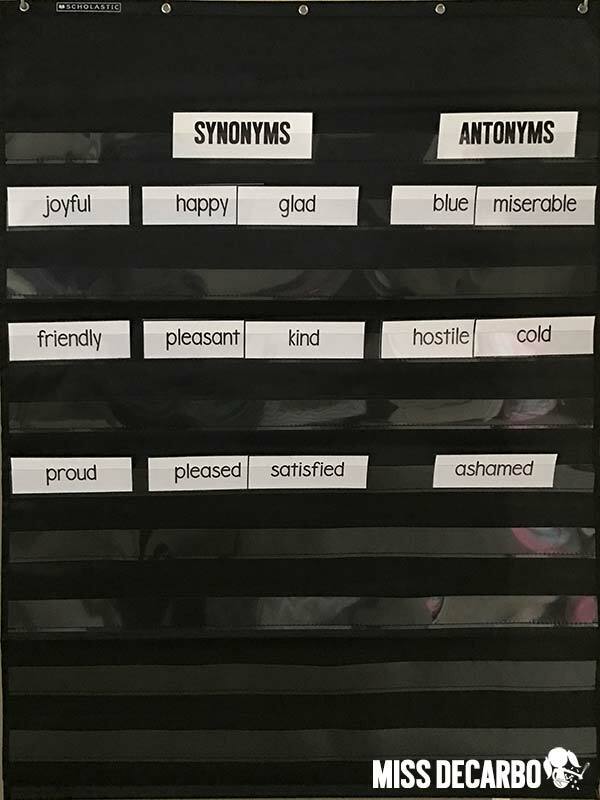 Feel free to choose this activity instead of the synonym and antonym word sort, or as an additional synonym and antonym activity. As you can see above, I’ve replaced the same story from Day 1 with synonyms and antonyms instead of the focus words. The story STILL makes sense AND my kids are now able to see the connection between the various words. Plus, it’s EASY! We know by now that it is SO important to expose our students not just to many Tier 2 words but to provide opportunities that let them practice, see, and use these words within multiple contexts. 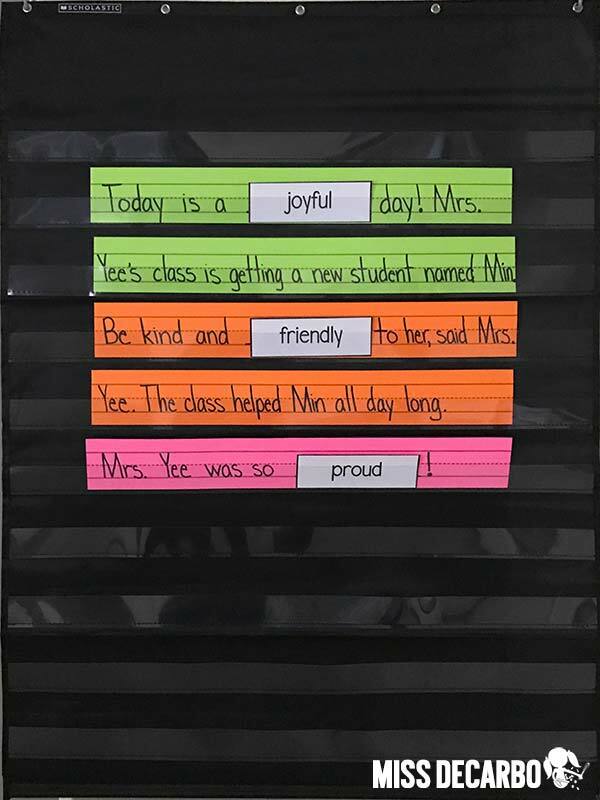 One of the activities I like to do to teach my students about synonyms and antonyms for specific words is to bring BACK the short introduction passage you used on Day 1. You’ll repeat the lesson plan, but instead, you’ll use synonyms and antonyms for the week’s words instead of the focus words! 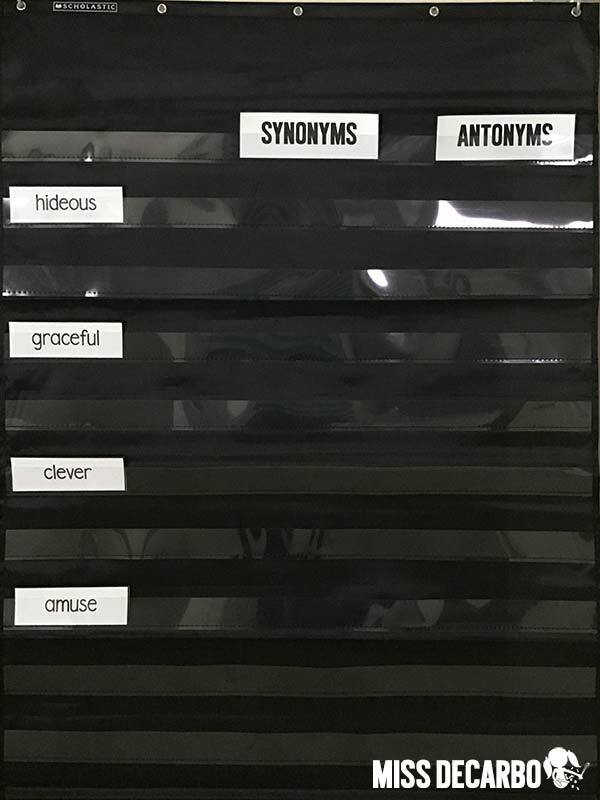 Your students will have SO much fun picking and choosing synonyms and antonyms (with your leadership and guidance) for each blank space. Sometimes, this turns the stories into super SILLY stories and it is so much fun! Within each Second Grade Vocabulary Curriculum set, you’ll find a Word Play Menu. On Day 4, you’ll pick and choose a word play activity off of the menu. Each set will come with 2-3 new word play activities to choose from. So, Set 1 has three activities on the menu. When Set 2 is released, the word menu will include those same three activities, plus 2-3 new ones to choose from. As you can see, your Word Play Menu will continue to grow throughout the year! Word Chat is a higher-order thinking activity that uses illustrations for each word. It can be completed within a whole group setting, in a small group, or within a learning center. You are your students will have a discussion about each picture card. On the bottom of the card are the week’s focus words. Your students will work together or discuss which word the picture best describes, portrays, or shows. 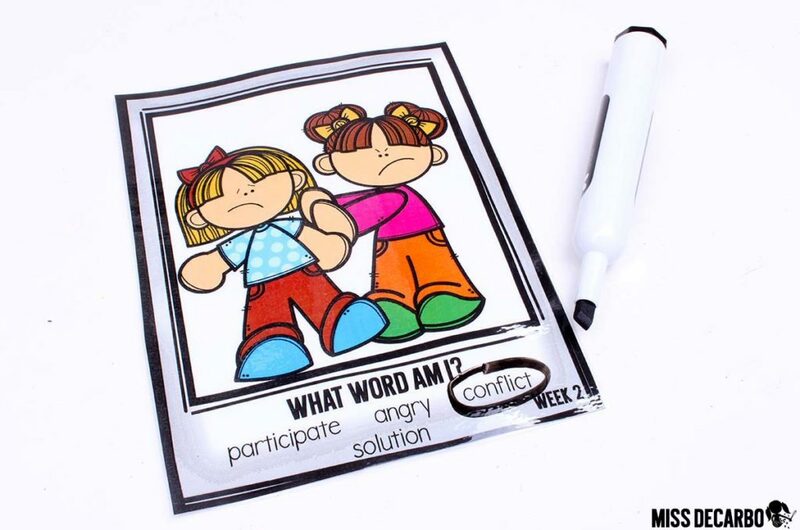 You can laminate the cards and circle the word with a dry erase marker (as pictured above). You can also choose to match the picture cards and the word cards using your pocket chart (as pictured below). Word Theater: Word Theater is a really fun word play activity to choose from for Day 4! Your students can work in small groups or in partners for this activity (I prefer partners, as I think it’s just easier to manage and allows for more participation.) Students can choose a character stick and orally create a story or a “play” that uses the week’s focus words and/or synonyms and antonyms. 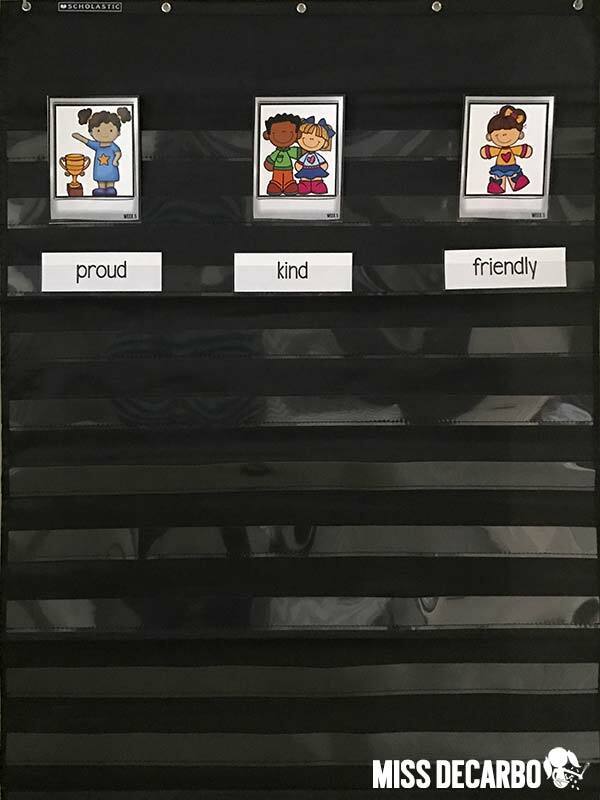 The Second Grade Vocabulary Curriculum also includes a blank template so that your students can draw and color themselves or other people they know as character sticks! This activity encourages students to USE the words on their own and practice what they sound like in conversational speech. 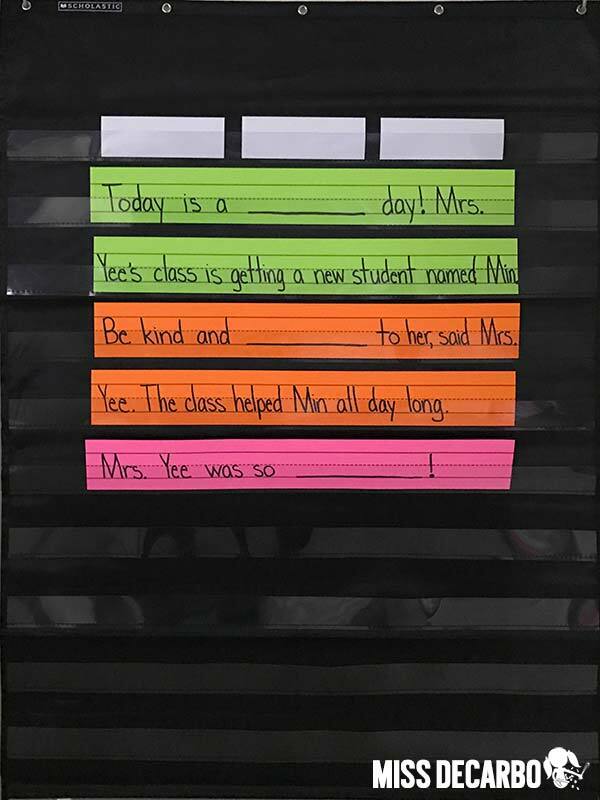 Day 5 gives second graders the opportunity to use what they have learned about their new words by writing their own sentences. 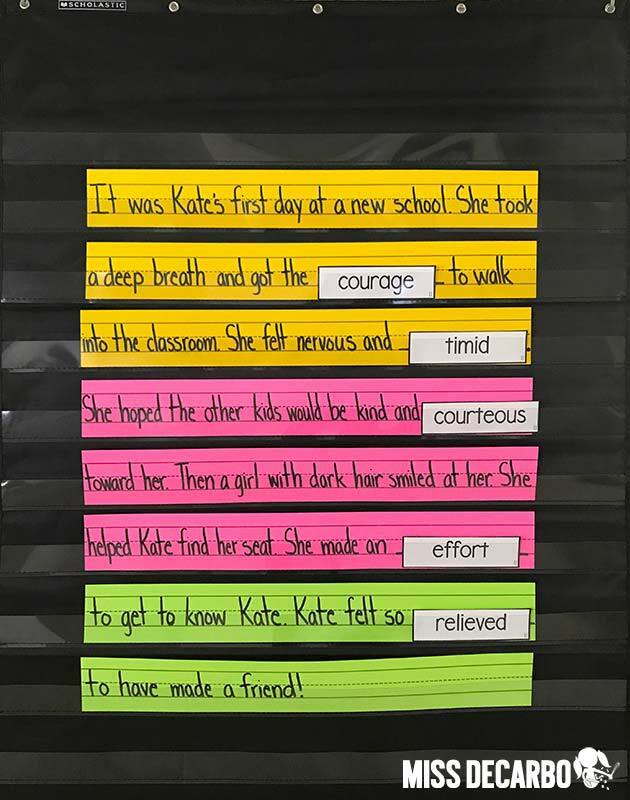 Sentence stems have been provided for this activity to ensure the sentences the students write and create make sense and are used correctly. How many times have you asked a student to come up with a sentence using a vocabulary word, and the sentence is completely off-the-wall and nonsense? (If you could see my right now, I’m raising my hand!) For example, you tell the student to come up with a sentence using the word decipher and the student says “My hot dog is decipher.” Uhh…not quite! 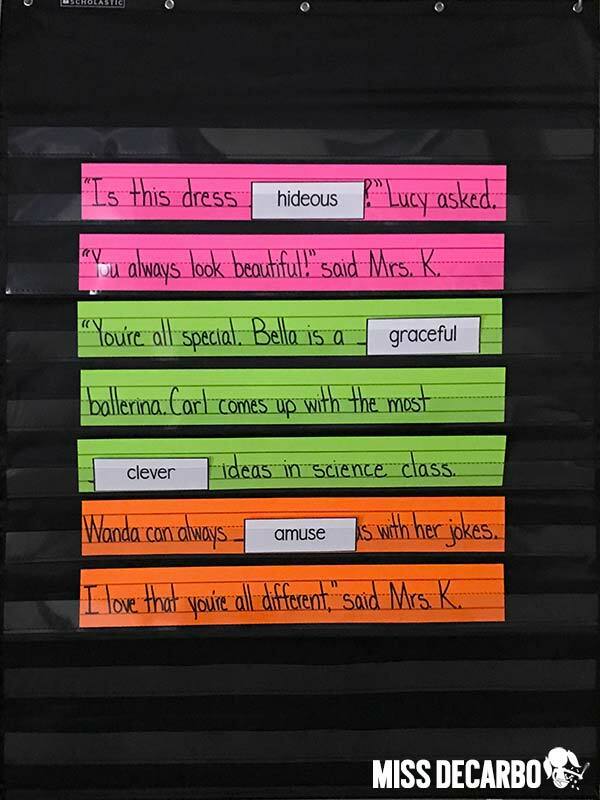 Sentence stems provide students with the context they need to be able to use the word and apply it independently. It also helps provide them with a model for using the words conversationally within discussions they will have with others. Although the sentence stems help the students, they still need to have a solid understanding of what the words mean before they can correctly complete the sentences. 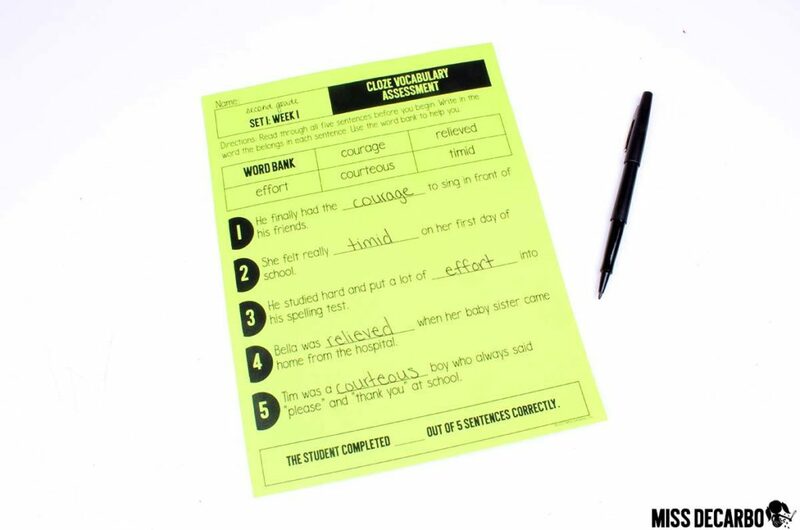 When students have completed the sentences, you can choose to have them share examples of their sentences with the whole class, in a small group setting, or with a partner. 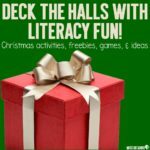 This activity also makes a nice take-home activity, literacy center, or writing lesson to integrate later into your day. Once again, this curriculum is SO flexible! 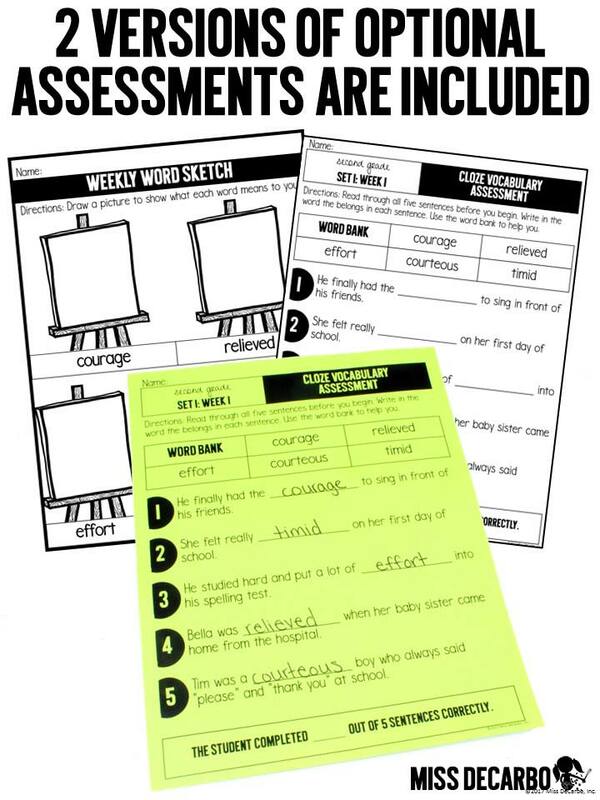 Two versions of assessments are included every week within the Second Grade Vocabulary Curriculum. A cloze vocabulary assessment includes a word bank and a coordinating sentence for each focus word. Your students will choose the correct vocabulary word from the word bank and write it into the sentence. 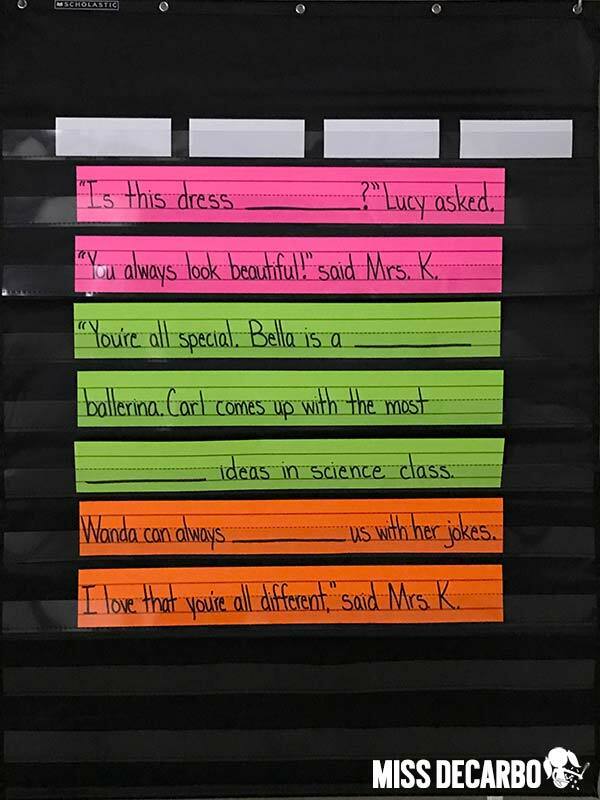 This assessment provides students with sentence context clues and is a similar set-up to the introduction passage activity they completed throughout the week. If you choose not to use this as an assessment, it would be a valuable small group reading follow-up activity or an alternative activity that you could use in exchange for the writing response page, for example. 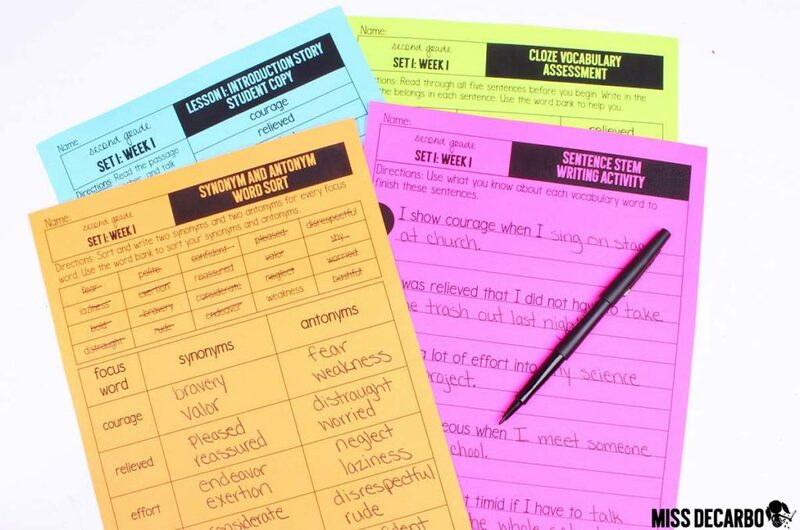 The curriculum also includes weekly word sketch printables that can be used as assessments. For this activity, students illustrate each word according to their own understanding and meaning. This is a more open-ended assessment, but extremely valuable! Again, this can be used as an extra or alternative activity if you wish not to use it as an assessment. 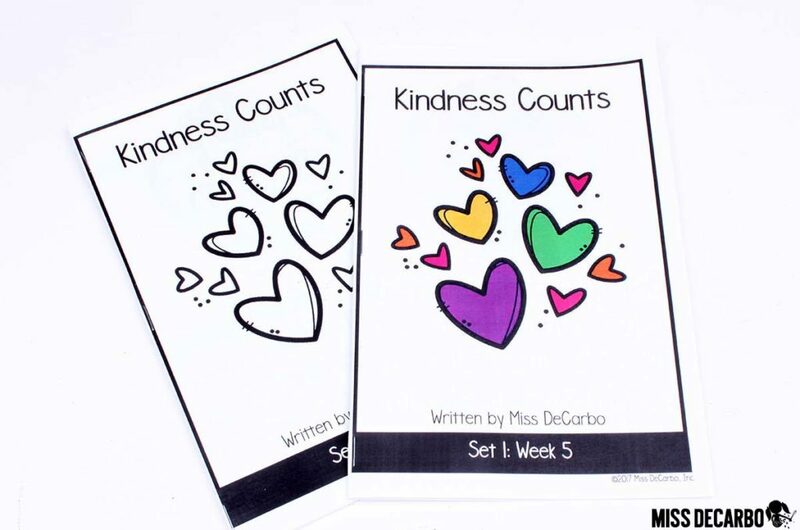 The Weekly Word Sketch printables are included in the kindergarten and first-grade curriculums. The cloze vocabulary assessments are unique to the second-grade curriculum. 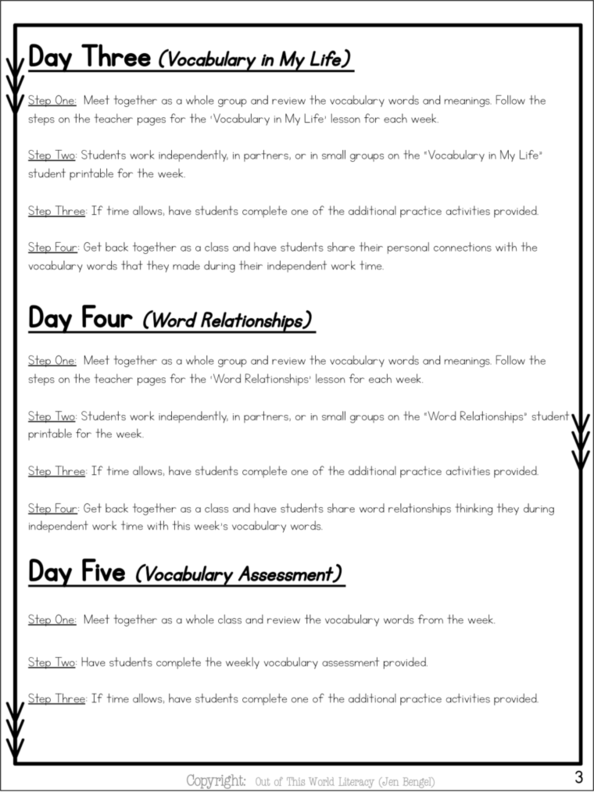 Below is a snapshot of the weekly vocabulary curriculum structure and routine for students in grades 3, 4, 5, and 6. Both the K-2 and the 3-6 sets have been designed to be 8 weeks long, with lesson plans taking about 15-20 minutes to complete. 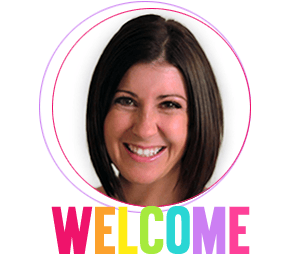 All of Jen’s lessons come with a Teacher Page that teachers can use to facilitate the lesson. Student copies are also included for each day. You will notice that throughout the week, students in grades 3-6 participate in word association games, word relationships, and real-life examples as they interact with the words. 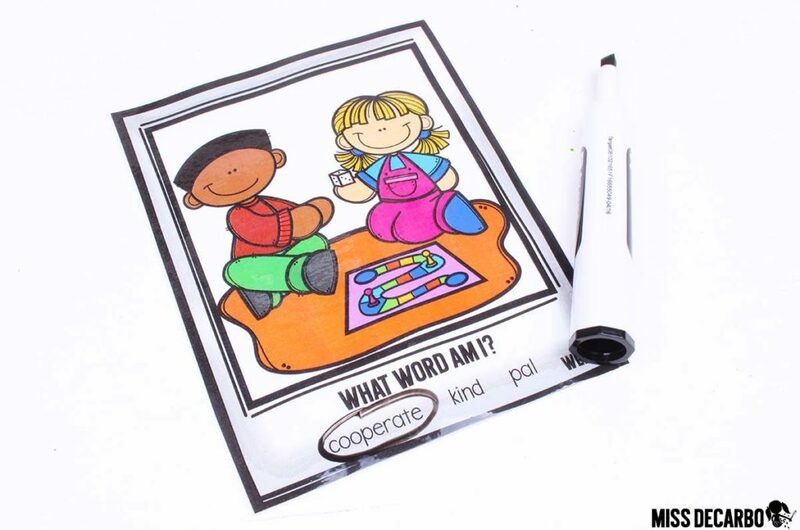 These same “word games” are included within the K-2 Discussion Question pages for Day 1 and Day 2 in the kindergarten, first, and second-grade curriculum. These similarities create a wonderful vertical alignment for students throughout a school building or district. Thank you so much for taking the time to “walk through” the kindergarten, first-grade, and second-grade vocabulary routines with me! 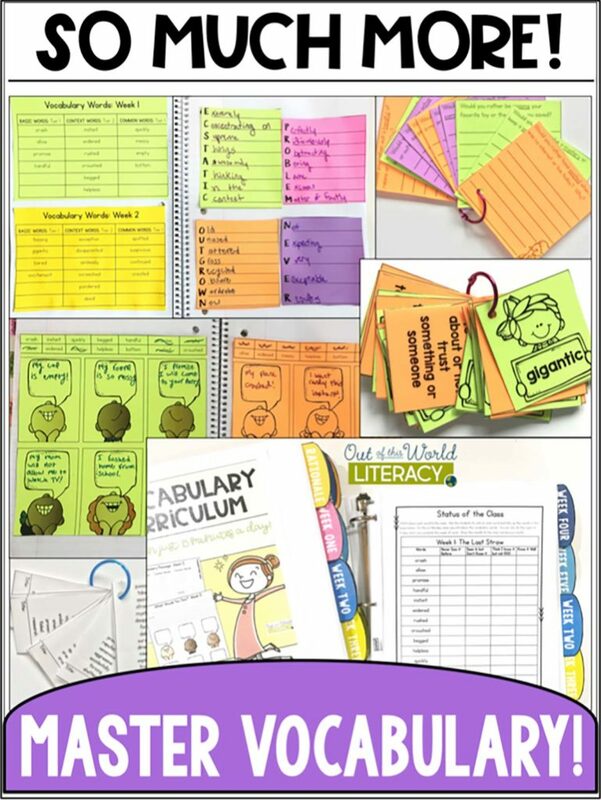 I hope this gave you some ideas on how to teach vocabulary, explained the importance of interacting with words, and helped you to better understand the layout of our curriculum resource packs. 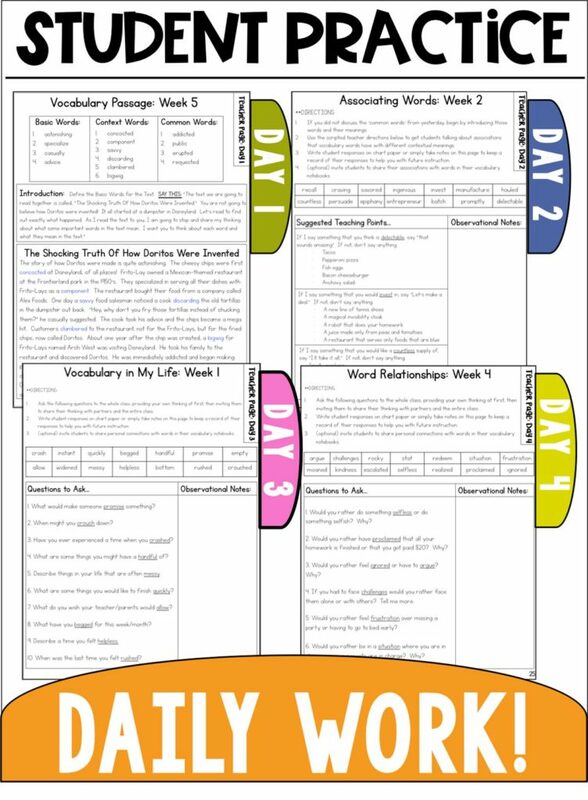 You can download the free preview of each curriculum resource to learn and see even more, and get started today with your new vocabulary weekly routine! Feel free to pin the image below to save this post for later or share it with your teaching friends. The details that you go through in how to teach vocabulary are incredible. I love how you show us how it looks different at each of the grade levels. Well done. I really love this! We struggle with teaching vocabulary and this makes it so easy! How did you decide what words to include in your program? Are they from particular lists? Thank you for your help!! Hi, Emily! The words do not come from any particular lists. Since we know that teaching words in isolation is not shown to be effective, these words came directly from the passages and stories that I wrote for the curriculum. These passages and books were strategically written to include appropriate and meaningful Tier 2 words that your students will see, hear, and read within real-life situations, conversation, and in texts. Thank you for your response! This makes so much sense! I can’t wait to try it! I am a SPED teacher for Extended Resource room students in grades 3-6. These students are with me all day and most read at a grade 1 or 2 level. Would I purchase a lower grade level vocabulary packet? My students would not be able to read the upper vocabulary worksheets independently.